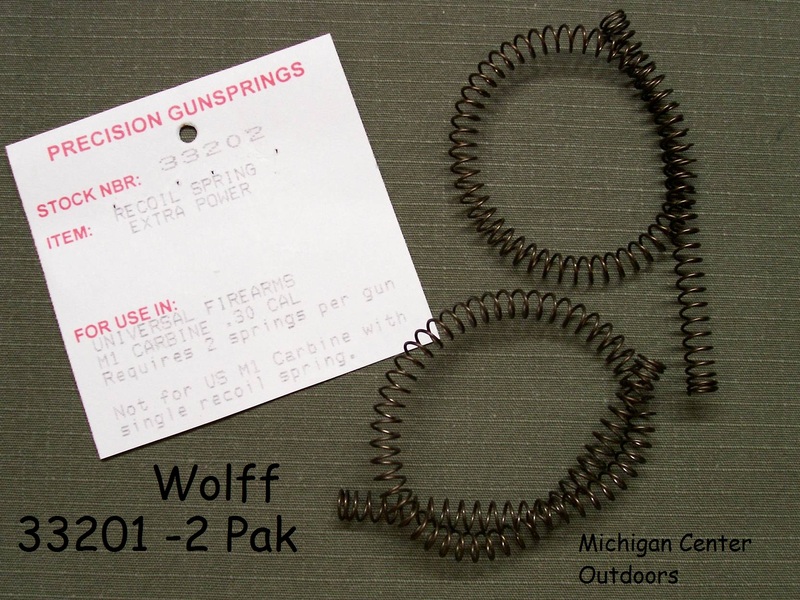 Wolff Gunsprings is a Manufacturer of Precision Springs for Firearms. 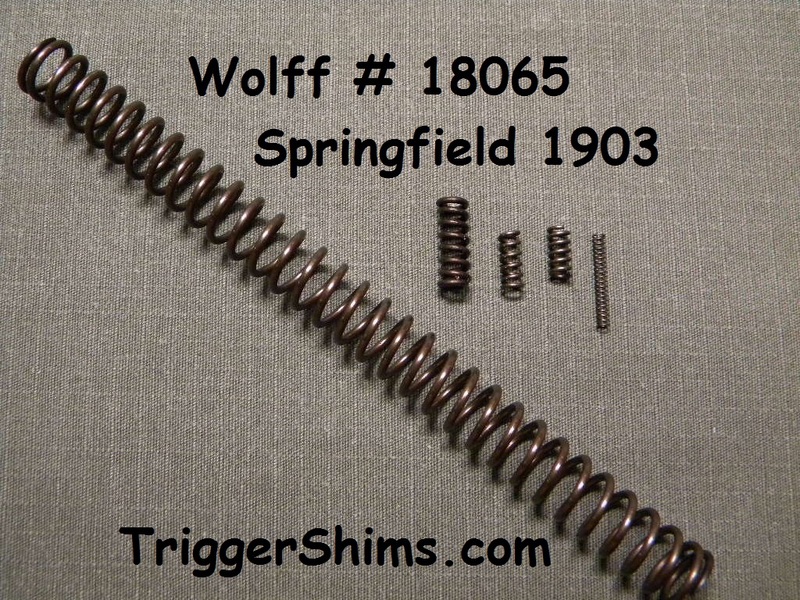 With over 62 years of Experience Exclusively with Firearm Springs, the Oldest Supplier of Aftermarket Gun Springs in the Nation, you can be assured that when you choose a Wolff Gunspring, you Get the Best! 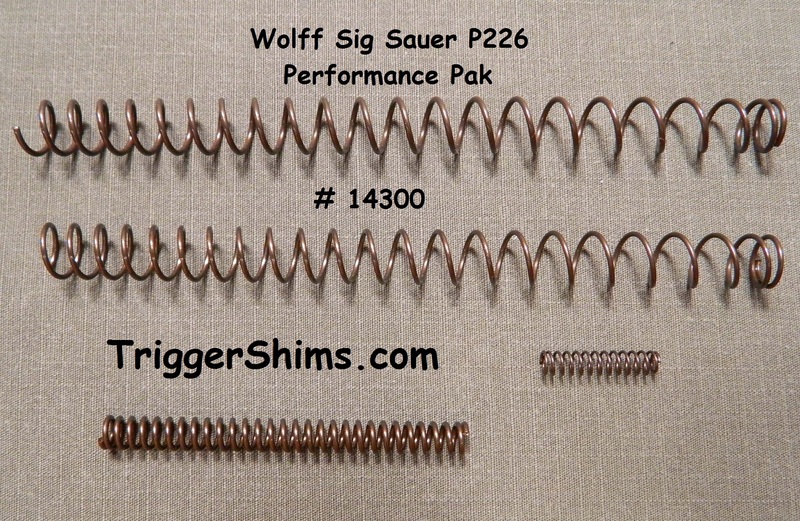 Shively Sales is a Factory Authorized Dealer for Wolff Gunsprings, Proudly Made in the U.S.A.
See Our Gun-Guides Page for Disassembly Guides. Your Payment is Secure with our PayPal Checkout. In a Hurry? We Value your Business! All of Our In-Stock Items Ship the Very Next Business Day. Reduced Power - Improved let-off and trigger pull. and Reduced Power Sear Spring to improve let-off. Extra Power Trigger Spring and Reduced Power Sear Spring to improve let-off. 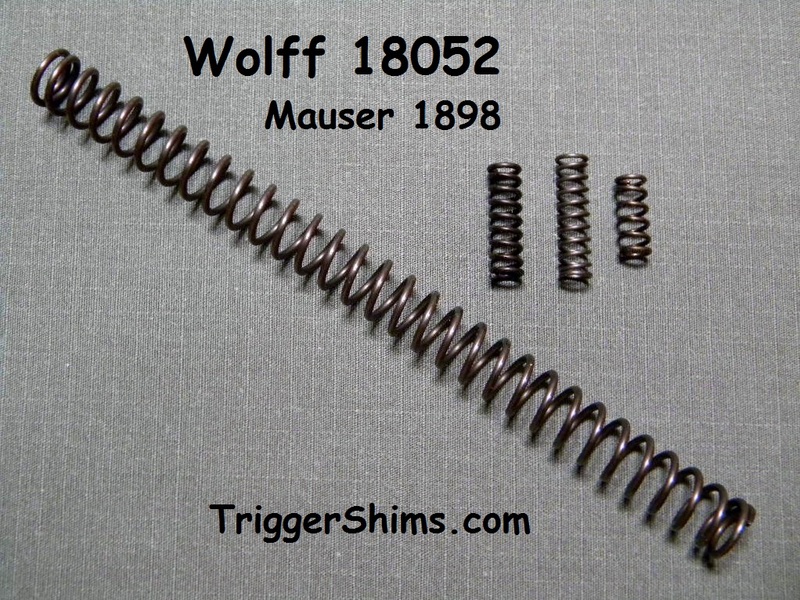 Wolff 16801 Extra Power Hammer Spring will Shorten Your Lock Time, and Improve Function in older guns. A Shorter Lock Time may help improve your accuracy on target. This spring is included in 18076 and 18075 Paks. 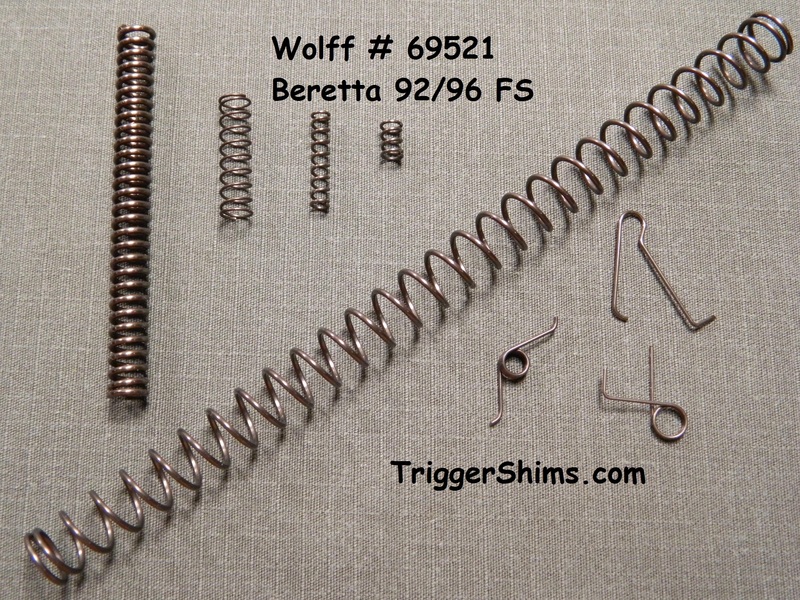 Wolff 89893 Reduced Power Sear Spring for a Lighter Trigger Pull. This spring is included in 18076 Spring Pak. 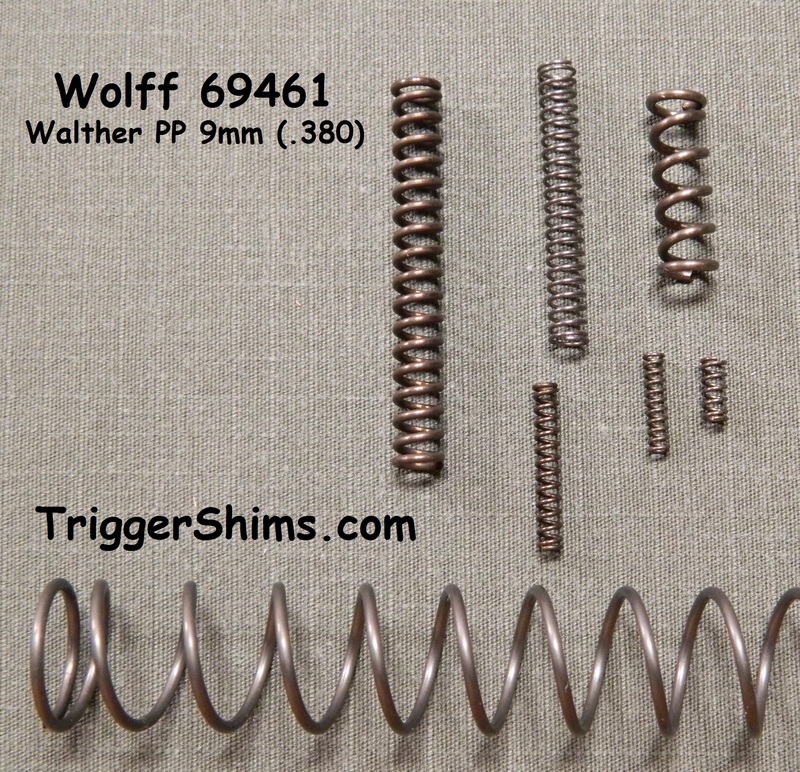 Wolff 89897 Extra Power Firing Pin Rebound Spring Power can be replaced by removing the firing pin. This spring is NOT included in any other Spring Pak. For the .22 LR ONLY. I have one in my 10/22T and it is so smooth! Pak contains 1 each 23 Lb. Blitzschnell striker spring and 1 each Reduced Power Trigger / Sear Spring to Improve Trigger. 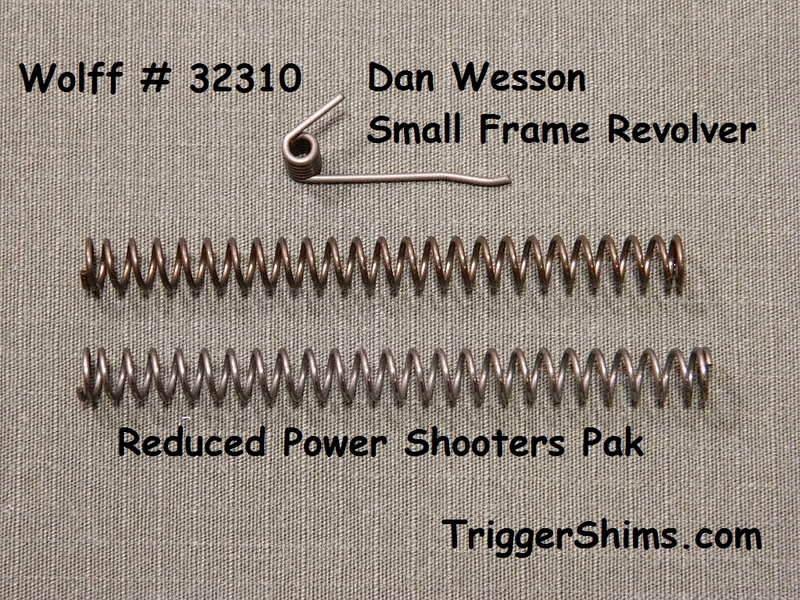 1 each reduced power trigger/sear spring to improve trigger. when replacing a new stock spring. about the same weight as an old "set" stock spring. Note: Use this spring with the VC77TS Sear if trigger pull is too light. 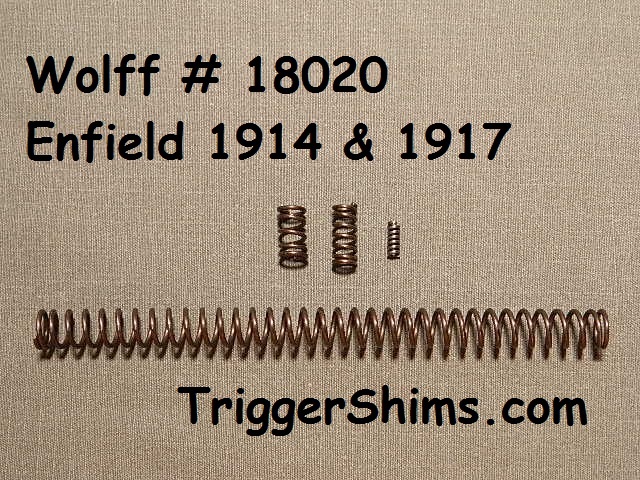 Wolff BLITZSCHNELL® precision speed-lock rifle striker springs for bolt-action rifles are made from the highest quality, high-tensile round section wires, as are all Wolff Springs. Each Blitzschnell striker spring has squared ends and is individually hand ground to provide flat seats, cleaned and oiled for long life and solid performance and require no fitting. 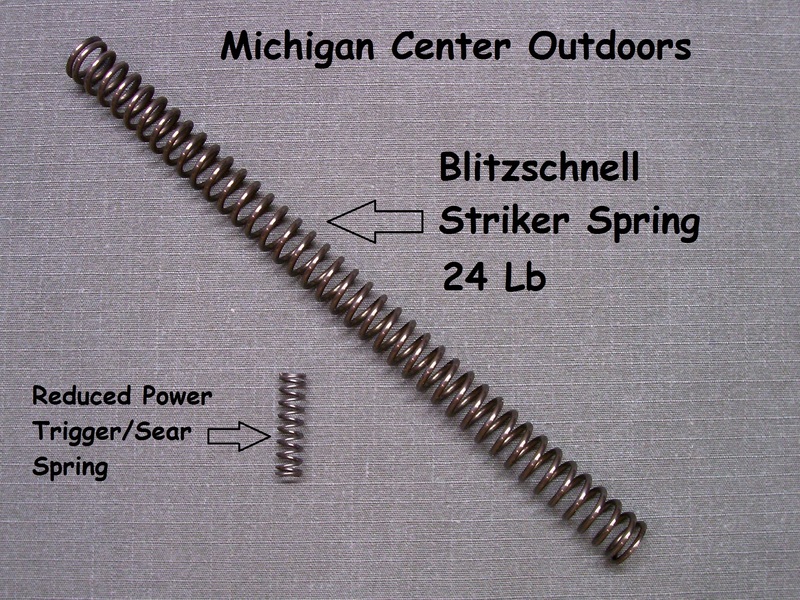 Blitzschnell striker springs provide dramatic improvement in lock-time over fatigued and factory springs which can greatly improve accuracy and reliability of bolt-action rifles. Each Blitzschnell striker spring is individually packaged and identified, and is ready for immediate installation and use. 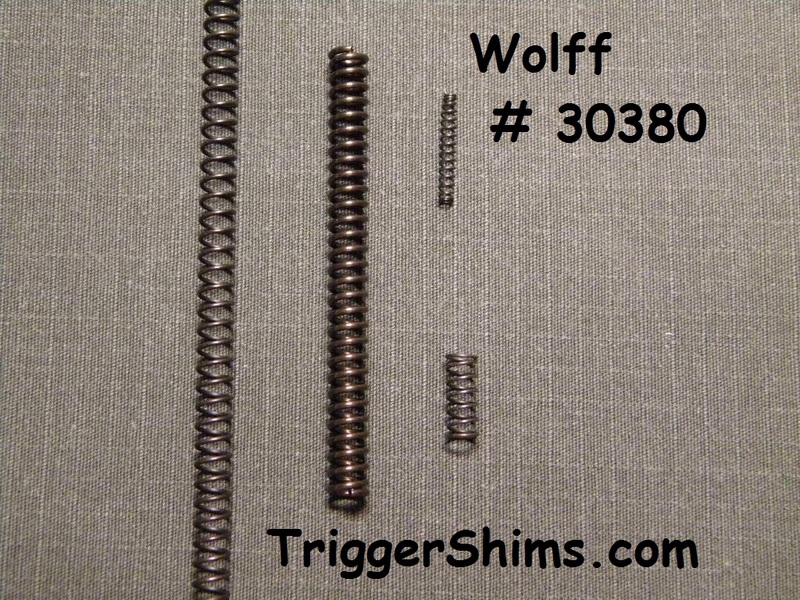 Wolff 30351 Extra Power Hammer Spring will Shorten Your Lock Time, and Improve Function in older guns. A Shorter Lock Time may help improve your accuracy on target. Contains: 1 each extra power recoil spring, firing pin spring, reduced power hammer spring and a reduced power trigger spring for improved performance. Ruger LCP 380 Standard Recoil Spring Set 9 Lb. 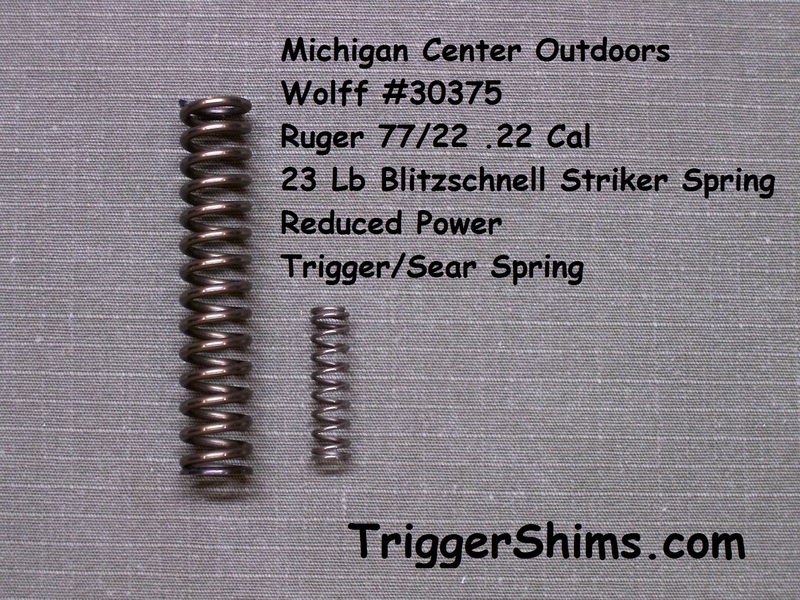 Wolff Recoil Spring Matched Set - 9 Lb. Ruger LCP 380 Extra Power Recoil Spring Set 13 Lb. 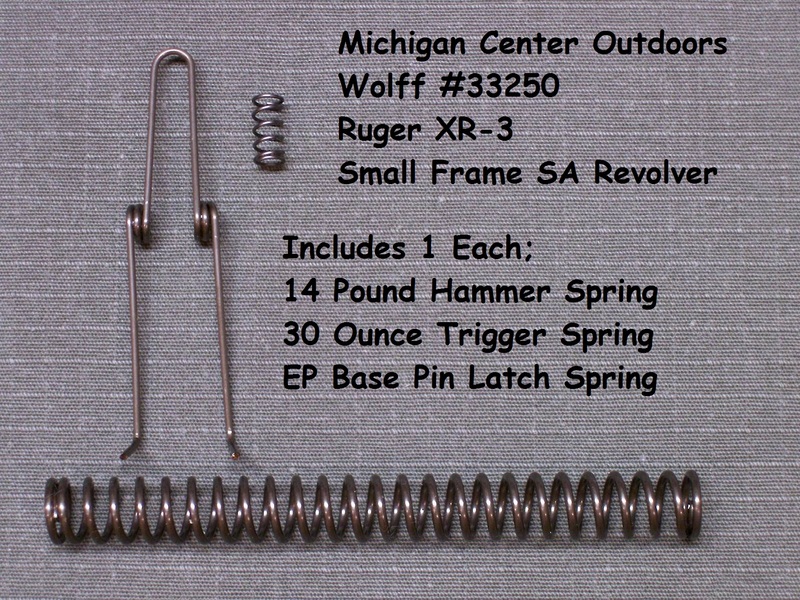 Wolff XP Recoil Spring Matched Set - 13 Lb. 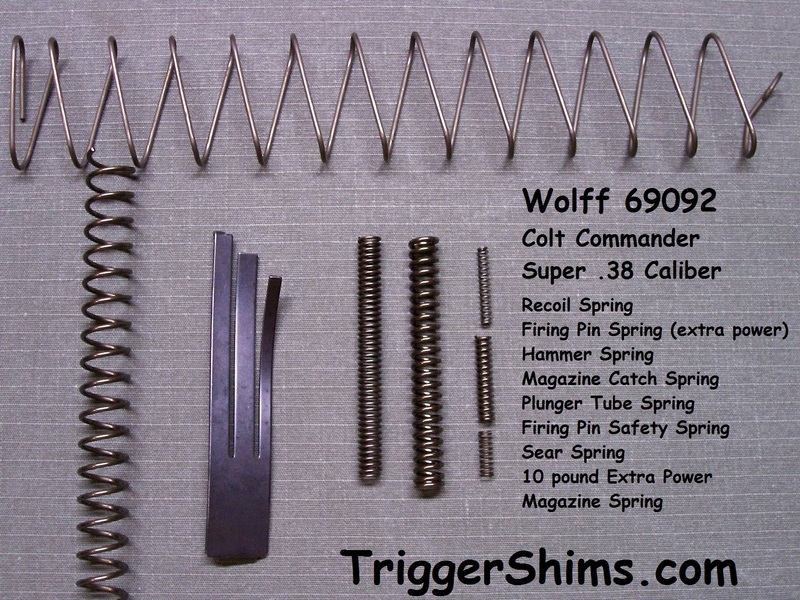 For early single actions with coil-type trigger return spring. Contains a reduced power trigger return spring, 17 pound reduced power hammer spring and an extra power base pin latch spring. 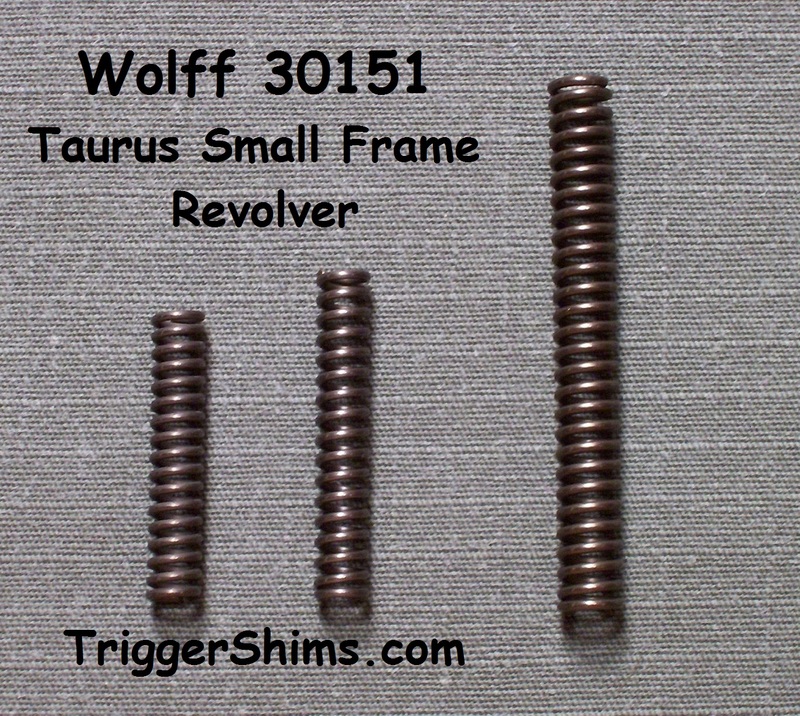 Wolff 30390 $13.95 Free Shipping! RSA - Reduced Power (40/19) - Contains 1 each 19 pound reduced power hammer spring, 40 ounce Wolff design reduced power trigger spring and an extra power base pin latch spring. These springs reduce and smooth out trigger pull essential for competition. Wolff 17101 $17.95 Free Shipping! RSA - Reduced Power (30/17) - Contains 1 each 17 pound reduced power hammer spring, 30 ounce Wolff design reduced power trigger spring and an extra power base pin latch spring. These springs reduce and smooth out trigger pull essential for competition. Wolff 17116 $17.95 Free Shipping! Two Major Variants of Vaqueros Exist. The Original Vaquero was marketed from 1993 until 2005, and was slightly larger than the Colt Single Action Army. The New Vaquero, (NV) produced from 2005 to the present is closer to the dimensions of the Colt Single Action Army. The New Vaquero has a small frame and uses the 33250 / 33251 Kit. Includes: New Vaquero Small Frame (NV) Series and Blackhawk 50th Anniversary models with XR-3 grip frame and internal hammer lock. Reduced Power (30/14) - Contains 1 each 14 pound reduced power hammer spring, 30 ounce Wolff design reduced power trigger spring and an extra power base pin latch spring. These springs reduce and smooth out trigger pull essential for competition. Wolff 33250 $17.95 Free Shipping! Reduced Power (40/14) - Contains 1 each 14 pound reduced power hammer spring, 40 ounce Wolff design reduced power trigger spring and an extra power base pin latch spring. These springs reduce and smooth out trigger pull essential for competition. Wolff 33251 $17.95 Free Shipping! 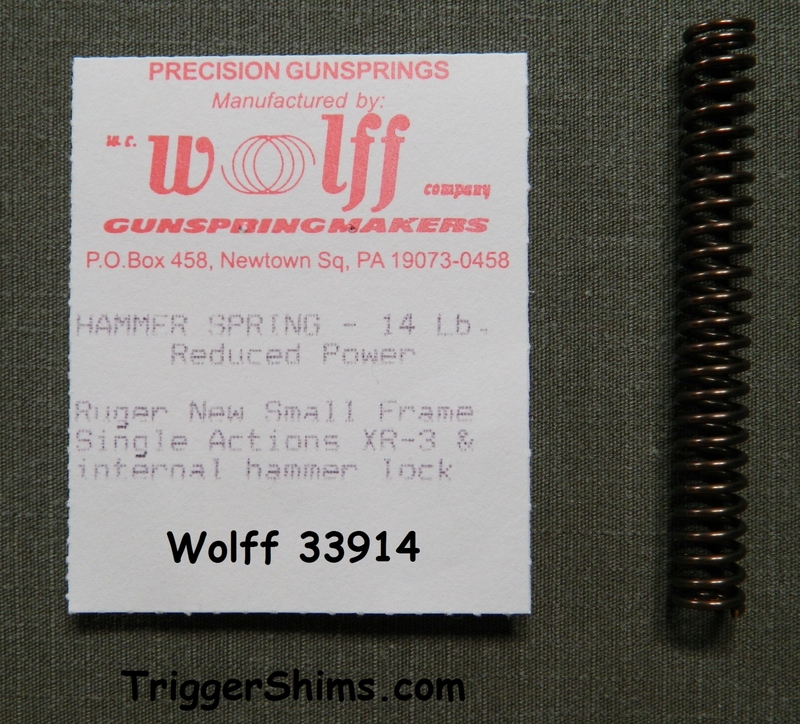 A shorter Main (Hammer) Spring is used in guns with the XR3 frame AND with an Internal Trigger Lock. models with XR-3 grip frame and internal hammer lock. Price is only valid when purchased and shipped with any other kit. Wolff 33914 $5.95 Free Shipping! 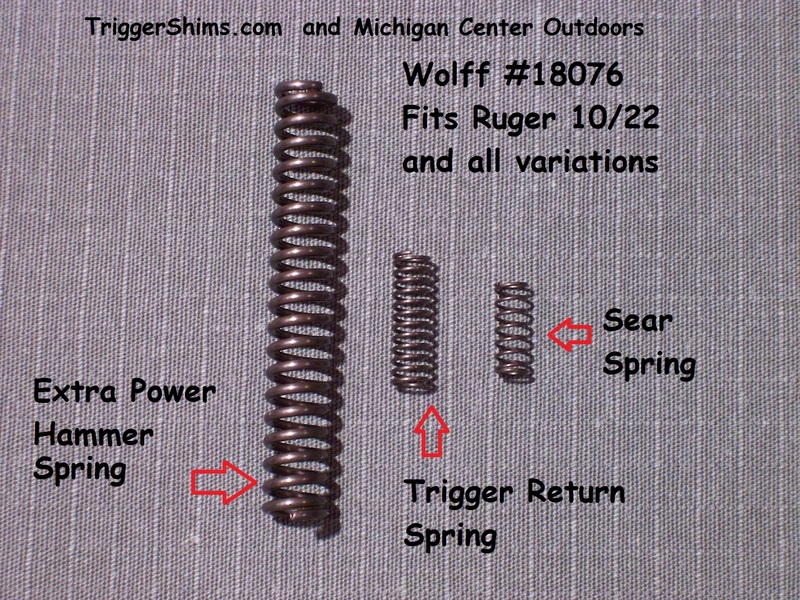 Ruger New Model Single Action Revolvers have two different hammer spring lengths. 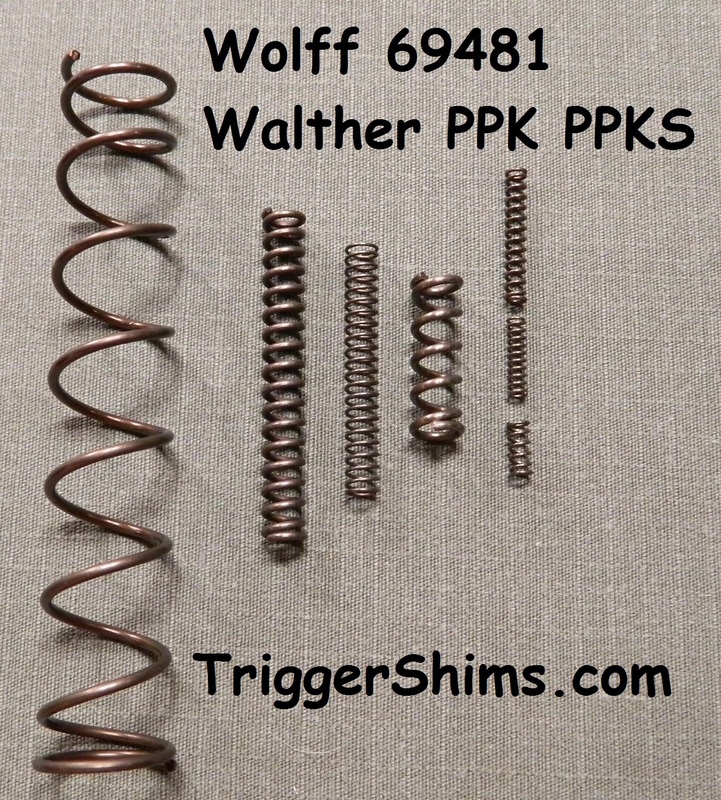 14# spring number 33914 in the 33250 kit is 2.925"
17# spring number 17217 in the 17116 kit is 3.315"
This pak contains 1 each 9, 10 and 12 pound reduced power hammer springs for Ruger GP-100 series revolvers and 1 each 8 and 10 pound trigger return springs allowing adjustment for lighter and smoother trigger and hammer action. 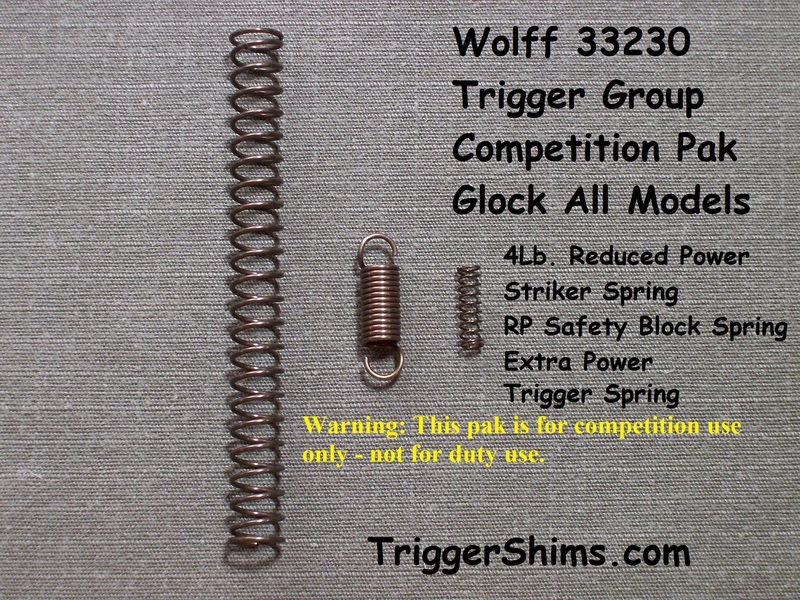 Note: factory trigger return spring is 12 pounds. Factory Hammer Spring is 14 pounds. Wolff 17110 $16.95 Free Shipping! 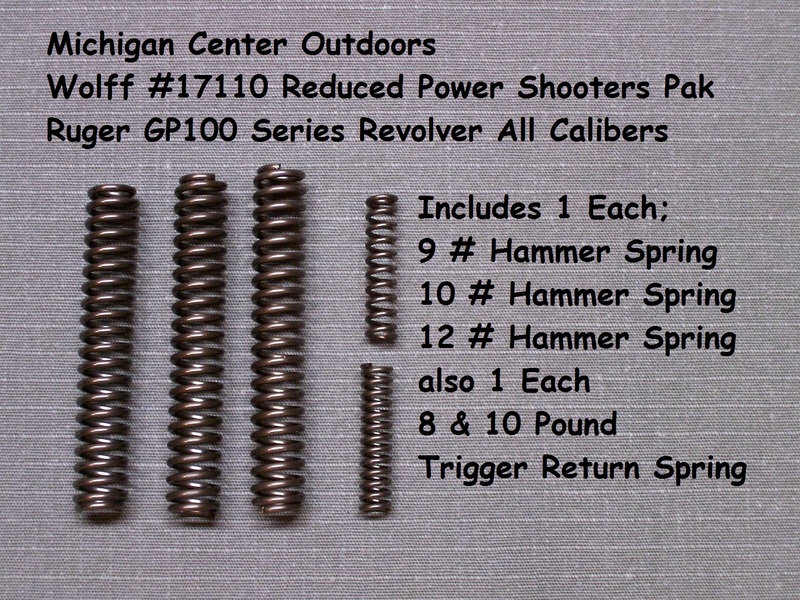 This pak contains 1 each 9, 10 and 12 pound reduced power hammer springs for Ruger SP-101 series revolvers and 1 each 8 pound trigger return spring allowing adjustment for lighter and smoother trigger and hammer action. 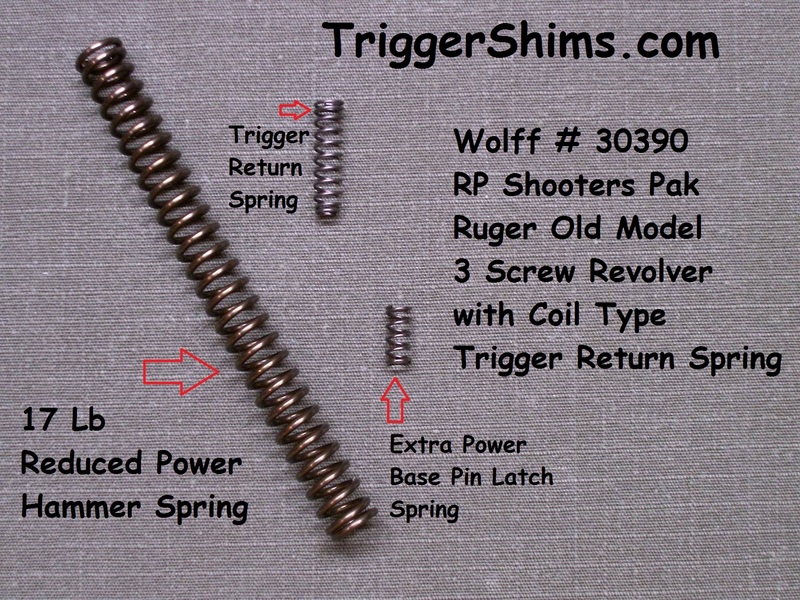 Note: factory trigger return spring is 10 pounds. 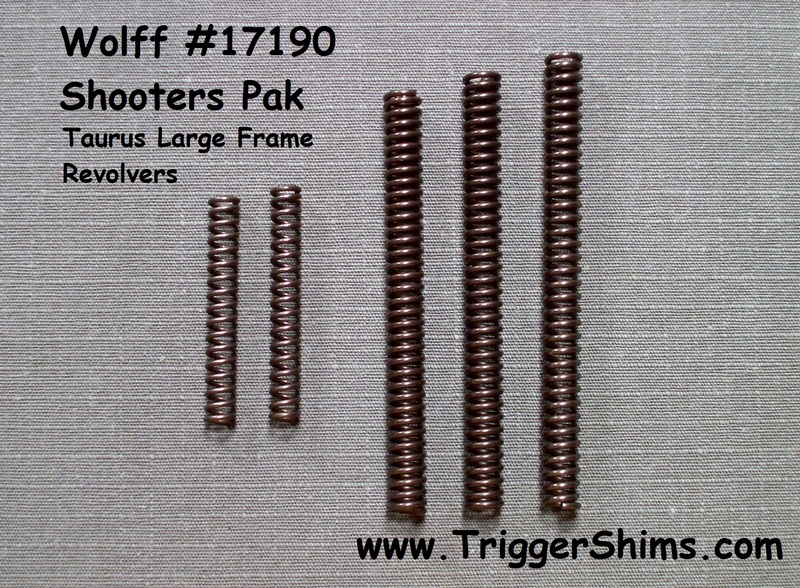 For your reference, the 12# Hammer Spring in this kit measures 1.925"
Wolff 17113 $16.95 Free Shipping! This pak contains 1 each 13, 14 and 15 pound reduced power hammer springs for Ruger SP-101 .22 Caliber Revolvers produced since 2011 and 1 each 8 pound trigger return spring allowing adjustment for lighter and smoother trigger and hammer action. 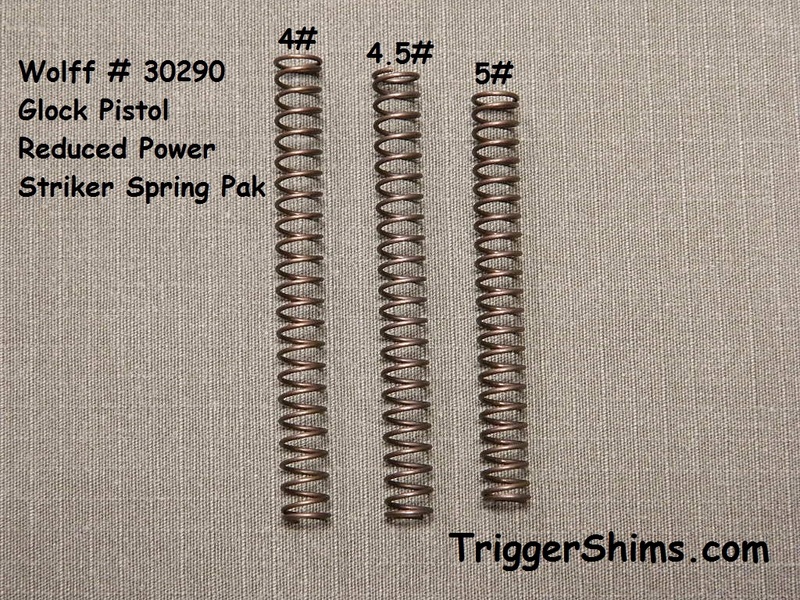 Note: Factory Hammer Spring is 16 pounds and factory trigger return spring is 10 pounds. Note: The Hammer Spring also Functions as the Trigger Return Spring on this Gun. Wolff RDA-3HSP $14.95 Free Shipping! Contains 1 each; Extra Power Recoil Spring, Extra Power Hammer Spring, Extractor Spring and Ejector Spring. Rifle Service Pak - extra power. Improves reliability and functioning. RIFLE SERVICE PAK - contains 1 each ejector spring, extractor spring, extra power hammer spring and extra power recoil spring. Rifle Service Pak - Contains 1 each ejector spring, extractor spring, hammer spring, extra power recoil spring, safety plunger spring, sear spring, magazine catch spring and slide stop spring. Wolff 18055 $24.95 Free Shipping! 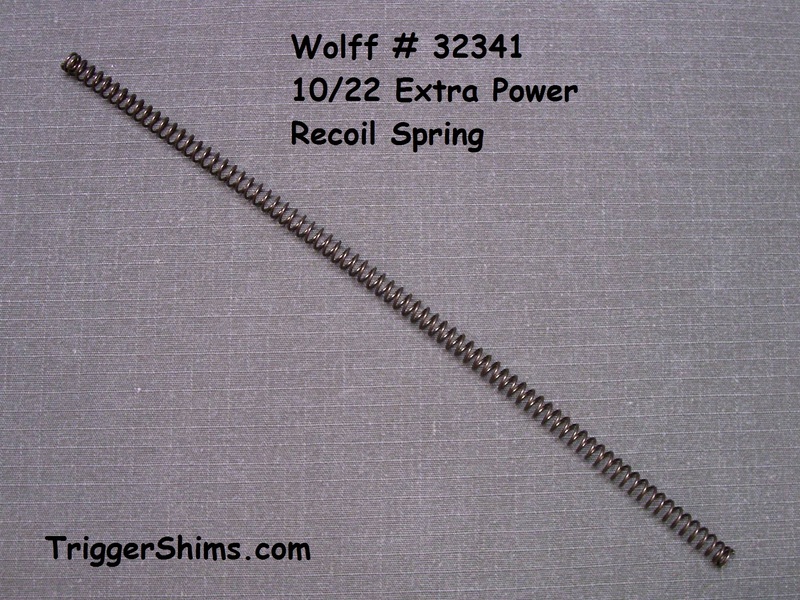 Recoil Spring - Extra Power - Improves overall function and feeding which is a common issue in the Universal models. 2 recoil springs are required per gun. Note: if your gun has a single recoil spring, see US M1 Carbine above. Rifle Service Pak - contains 1 each 20 pound striker spring, bolt sleeve lock spring, cutoff plunger spring, floorplate catch spring and sear spring. Rifle Service Pak - Contains 1 each 22 Pound Striker Spring, Bolt Sleeve Stop Spring, Floorplate Catch Spring and Sear Spring. Note: for Reference the Factory Striker Spring is 19 Lbs. Note: for Reference the Factory Striker Spring is 20 Lbs. Rifle Service Pak - Contains 1 each 18 Pound Striker Spring, Floorplate Catch Spring, Safety and Sear Spring. 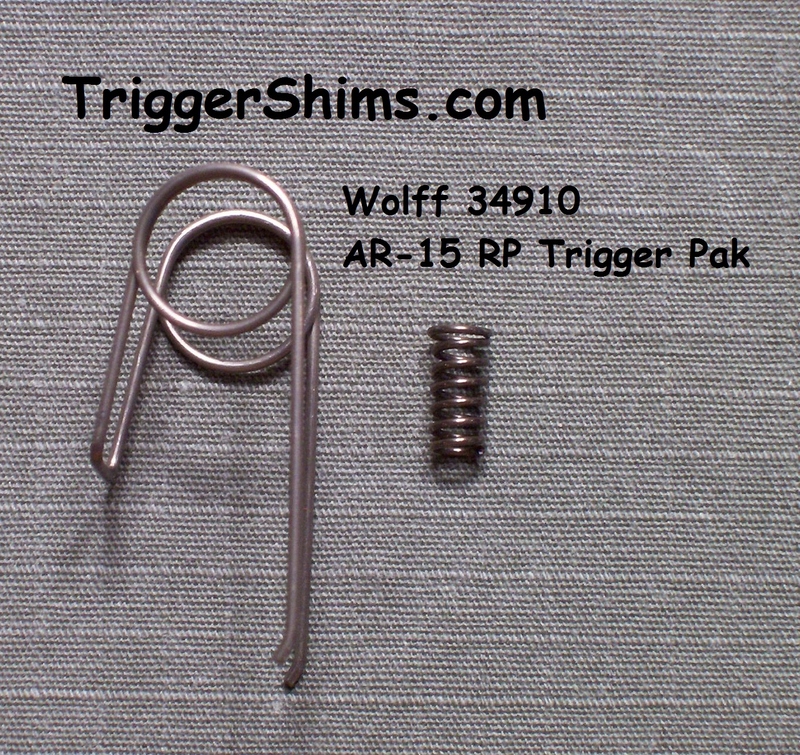 Wolff Trigger Function Pak also fits AR clones, contains 1 each Reduced Power Trigger Spring and Disconnector Spring. Designed to Lighten and Improve Trigger Function. 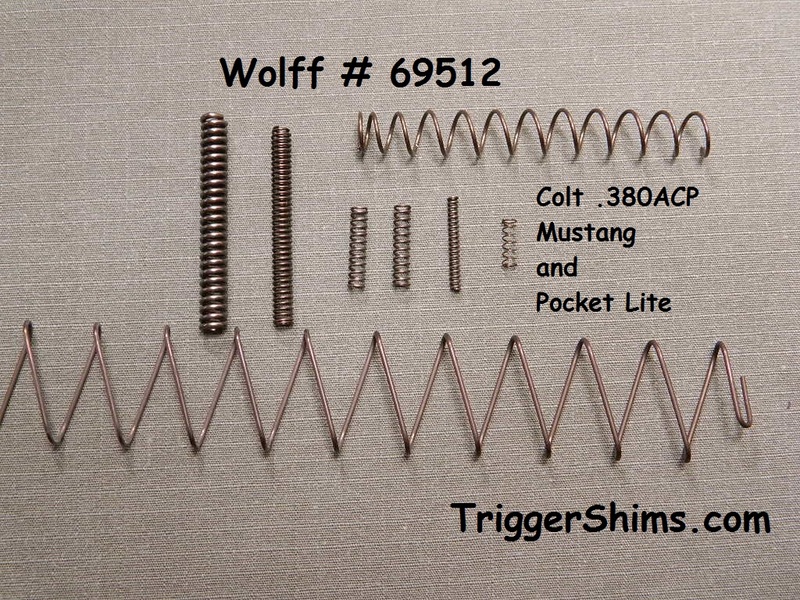 Replacement springs are for Colt AR-15, CAR-15, M-16 and M4 rifles. AR-15 Carbine Rifles and Most Clones. Rifle Service Paks - Springs to Return Rifle to Original Factory Condition. All springs are Factory Specification Strength. 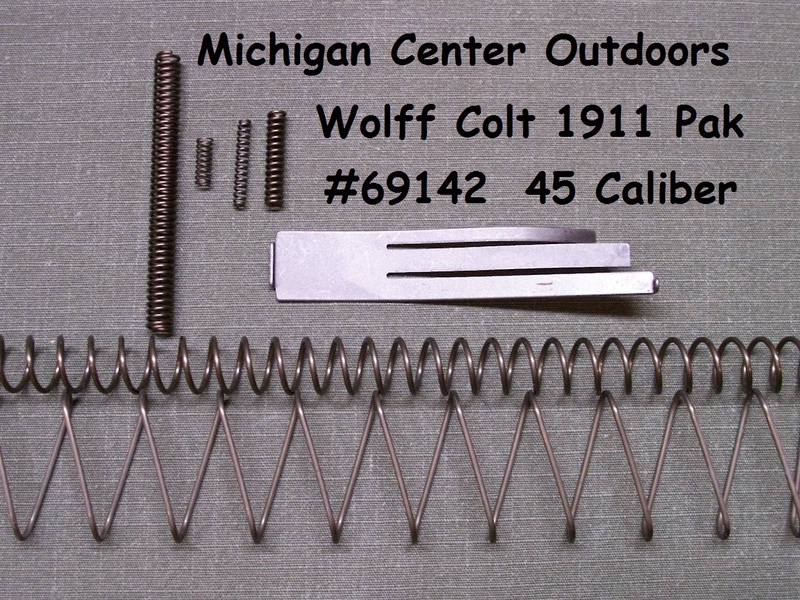 Contains 1 each Standard Recoil Spring, Bolt Catch Spring, Buffer Retainer Spring, Disconnector Spring, Dust Cover Spring, Ejector Spring, Extractor Spring, Forward Assist Spring, Front Sight Retainer Spring, Hammer Spring, Magazine Catch Spring and Trigger Spring. Note: Factory Spring is 21 Lbs. Note: Factory Spring is Approx. 34 Lbs. Hammer Spring, Slide Lock Spring. Wolff Factory Std. Recoil Spring, Extra Power Firing Pin Spring, Extractor Spring, Hammer Spring, Safety Plunger Spring and Magazine Catch Spring. 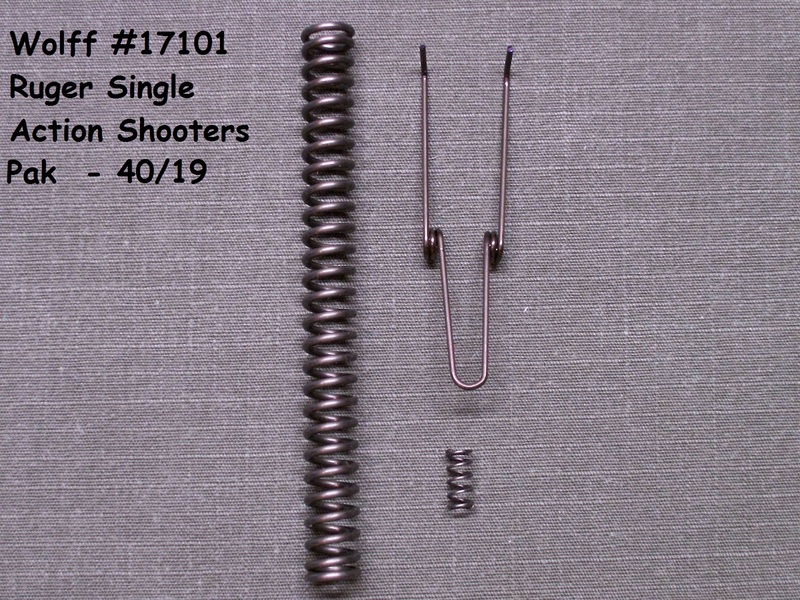 Note: Factory Recoil Spring is 17 Pounds. Type II - contains the following factory specification springs: recoil spring, firing pin spring (extra power), hammer spring, magazine catch spring, plunger tube spring, firing pin safety spring, sear spring and a 10 pound Extra Power magazine spring. 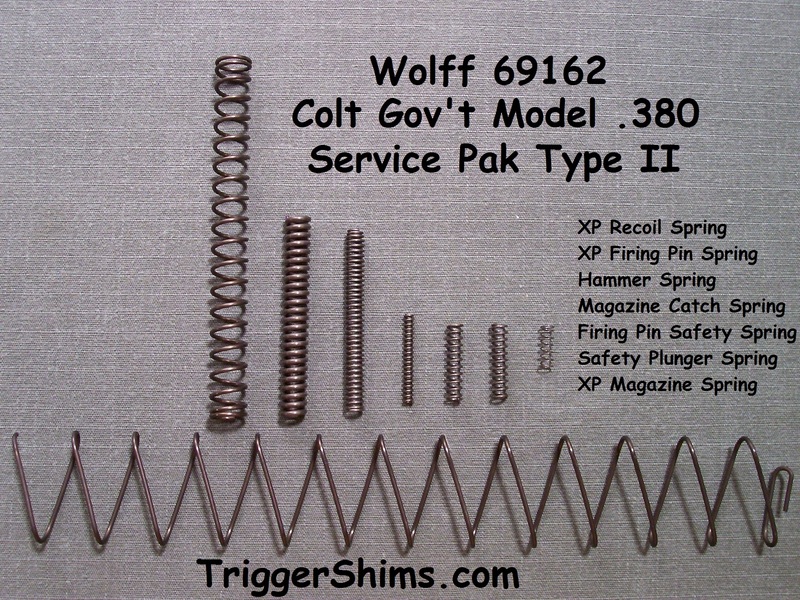 Wolff Extra Power firing pin springs are a must in Colt pistols prior to the inclusion of the firing pin safety mechanism and are highly recommended in all pistols. 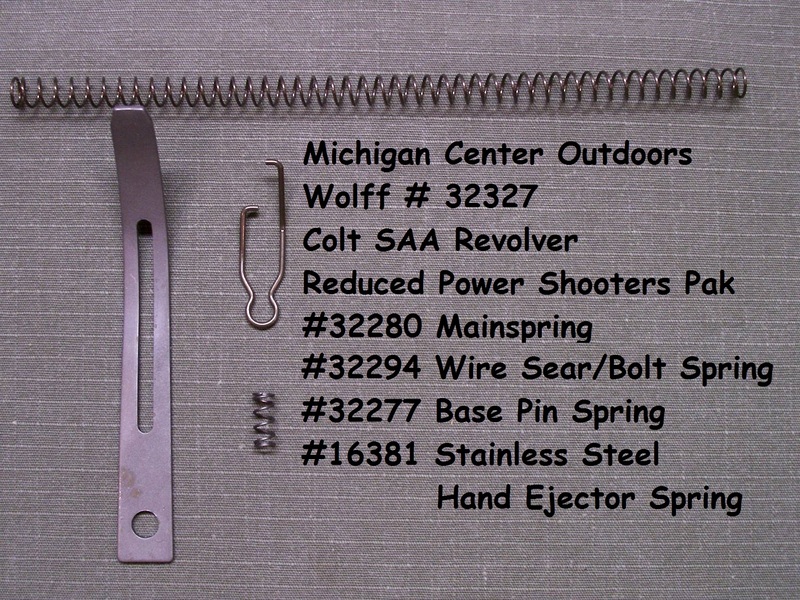 These springs are approximately 40% stronger than the factory springs and provide an increased margin of safety by helping to reduce the chance of accidental discharge due to the firing pin contacting the cartridge primer in the event of dropping the pistol in a loaded condition or from the increased inertia imposed on the firing pin with extra power recoil springs. 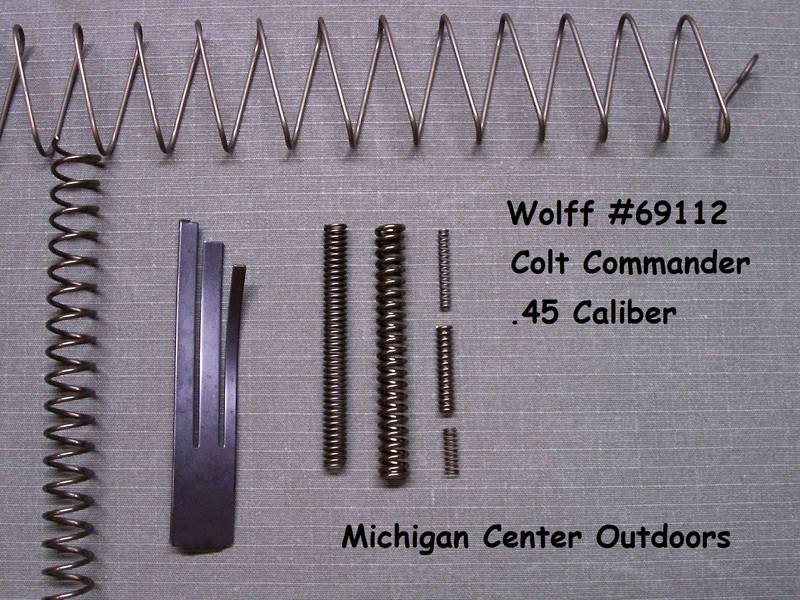 Every Colt pistol should have an extra power firing pin spring installed even when shooting the lightest loads. Colt Officer's Model .45, Colt 1991 Compact .45 series pistols. Type II - contains the following factory specification springs: recoil spring (.260" guide rod), firing pin spring (extra power), hammer spring, magazine catch spring, plunger tube spring, firing pin safety spring, sear spring and a 5% Extra Power magazine spring. Colt 1911, 1911A1, 1991, Gov't, MKIV, and Gold Cup series pistols. Type II - contains the following factory specification springs: recoil spring, firing pin spring, extractor spring, safety plunger spring and a 5% extra power magazine spring. Type II - contains the following factory specification springs: recoil spring, firing pin spring, extractor spring, and a 5% extra power magazine spring. This Kit Offers Improved Double Action Trigger Performance. Note: Factory Hammer Spring is 16.5 Pounds. Allowing Adjustment for Lighter and Smoother Trigger and Hammer Action. Field-King, Flite-King, Olympic series, Supermatic series, Sport- King, and Victor. 1 5% Extra Power Magazine Spring. This Kit Offers Improved Trigger Pull and Function in Competition Pistols. 1 each of the 4, 4.5 and 5 Lb. reduced power striker springs. Note: Factory Standard Weight Spring is 5.5 Lb. 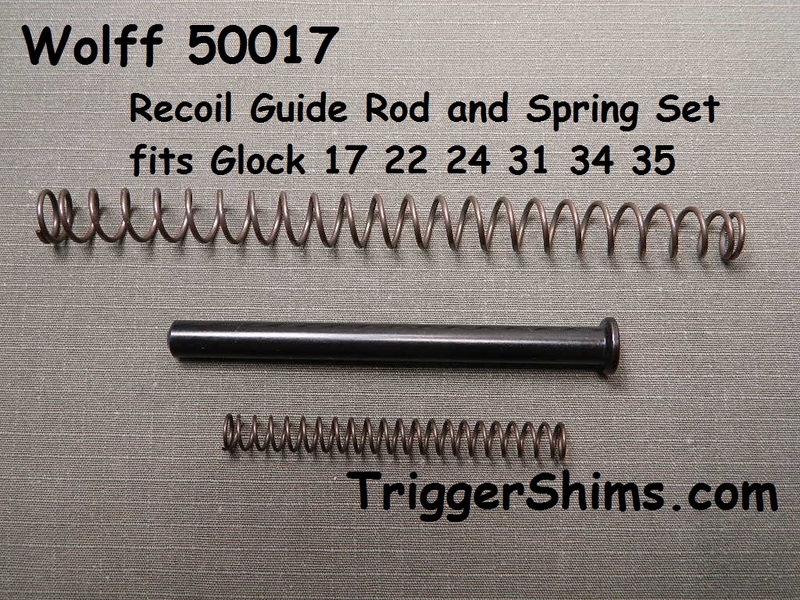 GLOCK Recoil Guide Rod & Spring Set 16 Lb. 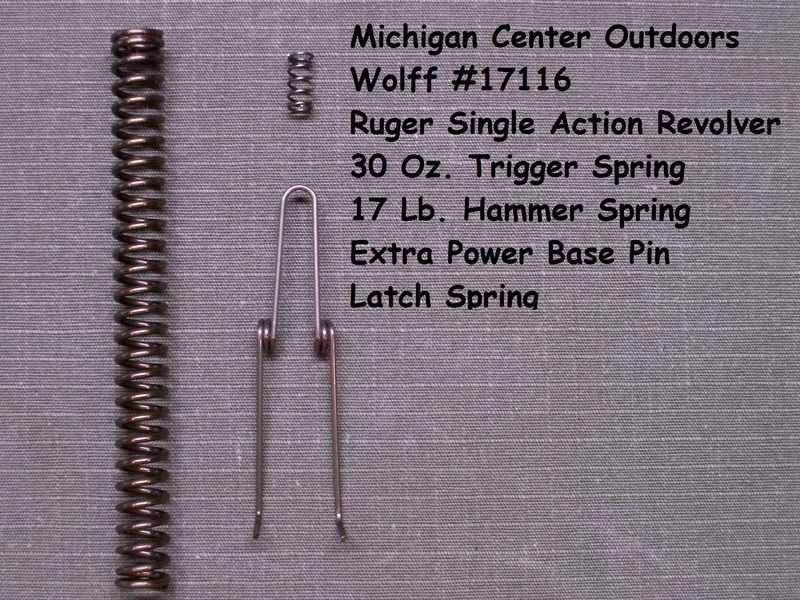 Wolff Guide Rod & Recoil Springs - 16 Lb. 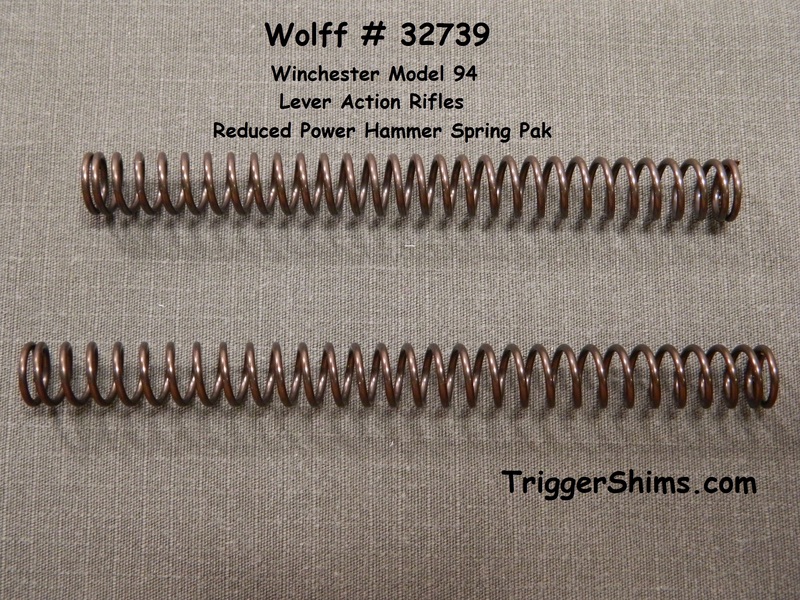 Wolff Striker Spring - 5.5 Lb. 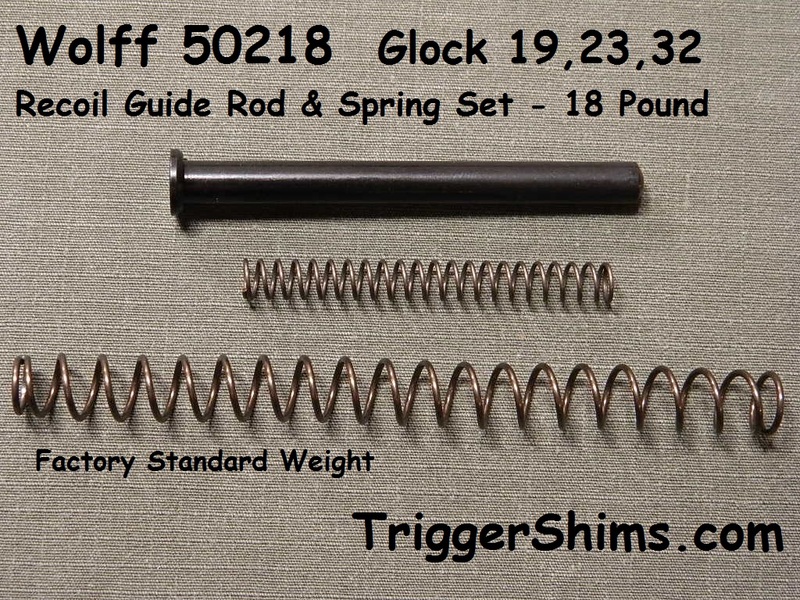 GLOCK Recoil Guide Rod & Spring Set 18 Lb. 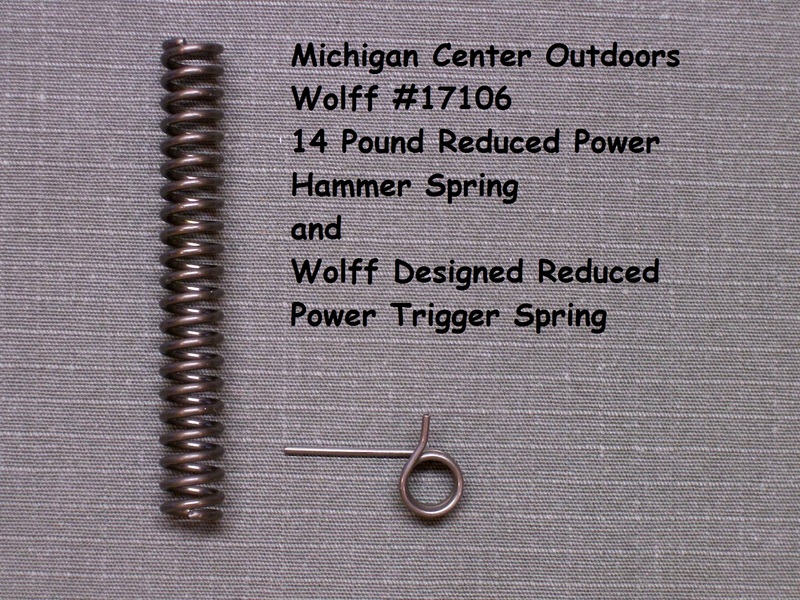 Wolff Guide Rod & Recoil Spring - 18 Lb. 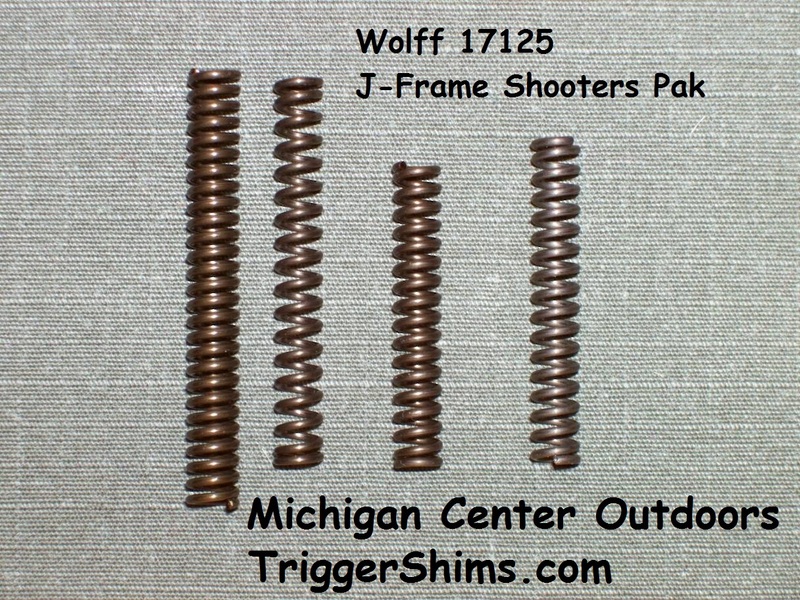 GLOCK Recoil Guide Rod & Spring Set 17 Lb. 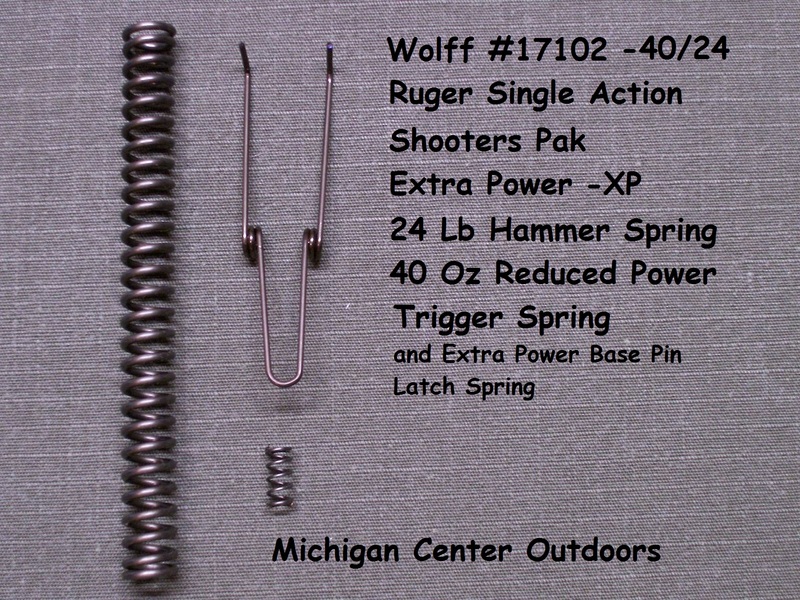 Wolff Guide Rod & Recoil Spring - 17 Lb. No Tools Needed for Installation! 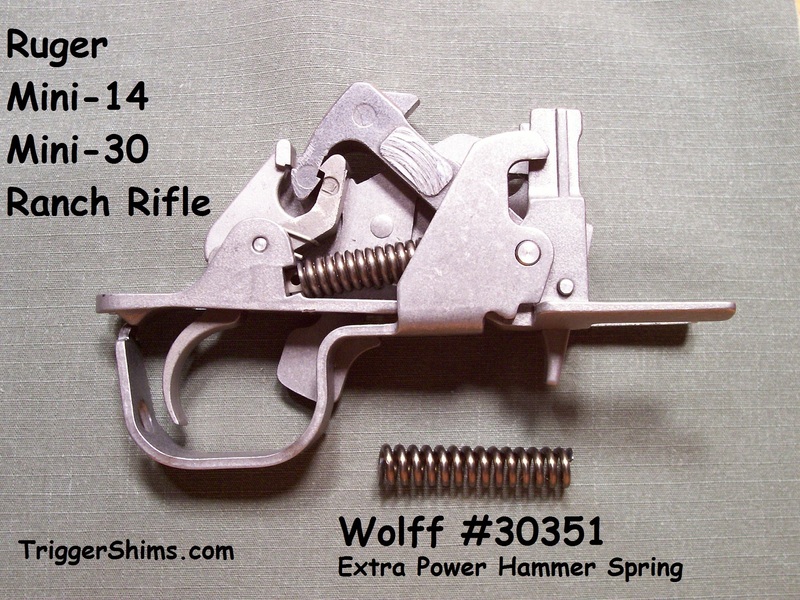 Wolff Striker Spring 3 Each Factory Strength 5.5 Lb. 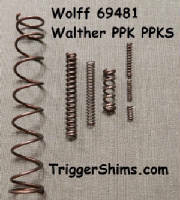 Kel-Tec P-32 Recoil Spring Set 9 Lb. 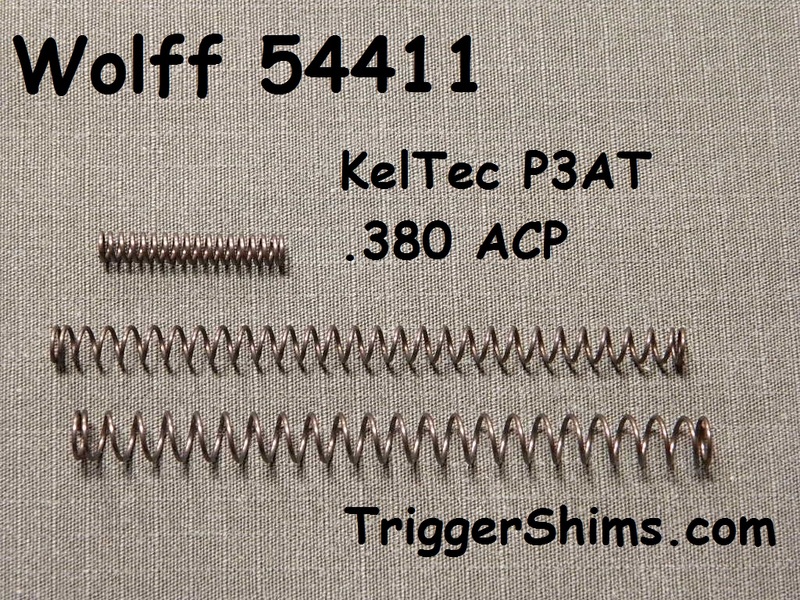 Kel-Tec P-40 Recoil Spring Set 17.5 Lb. 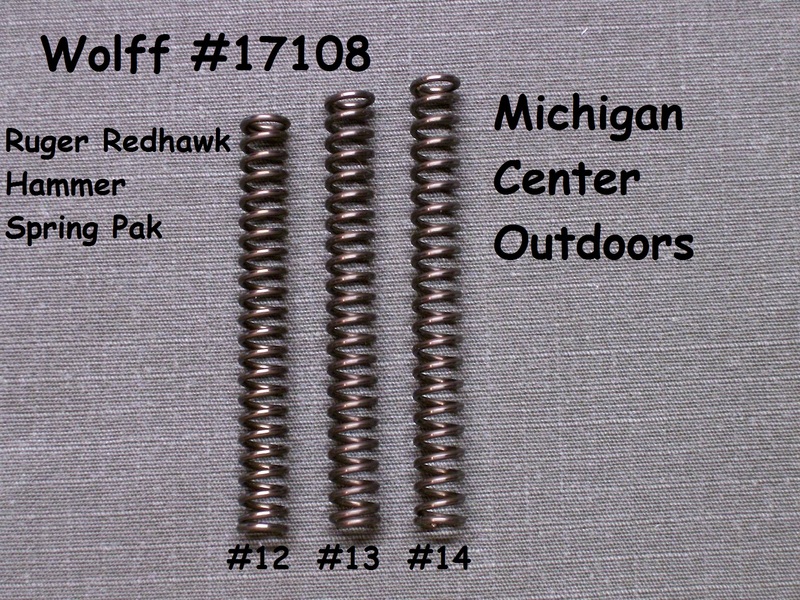 Wolff Recoil Spring Matched Set - 17.5 Lb. Kel-Tec P-11 Recoil Spring Set 16 Lb. 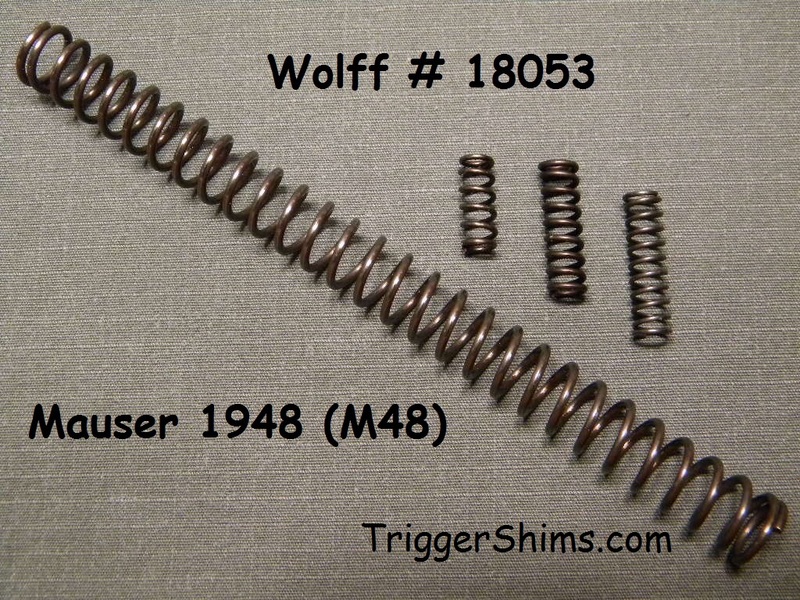 Wolff Recoil Spring Matched Set - 16 Lb. Kel-Tec P-3AT Recoil Spring Set 11 Lb. 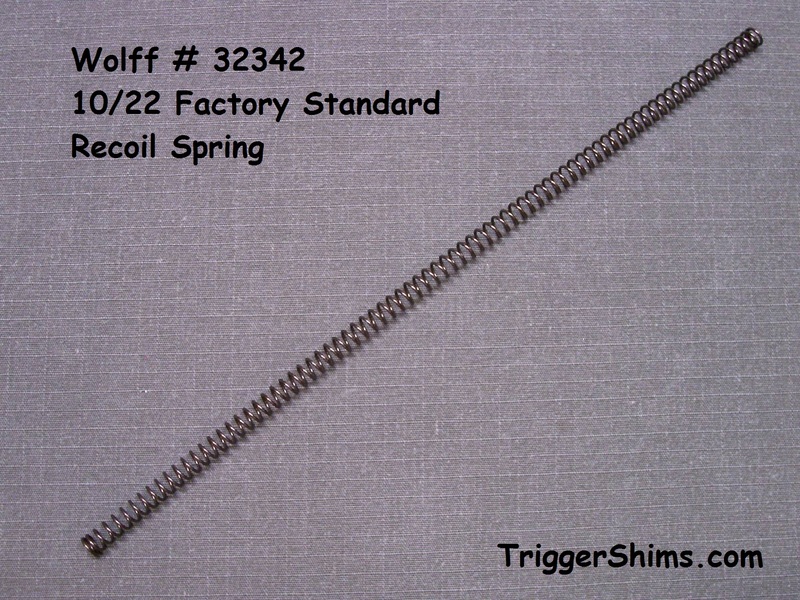 Wolff Recoil Spring Matched Set - 11 Lb. 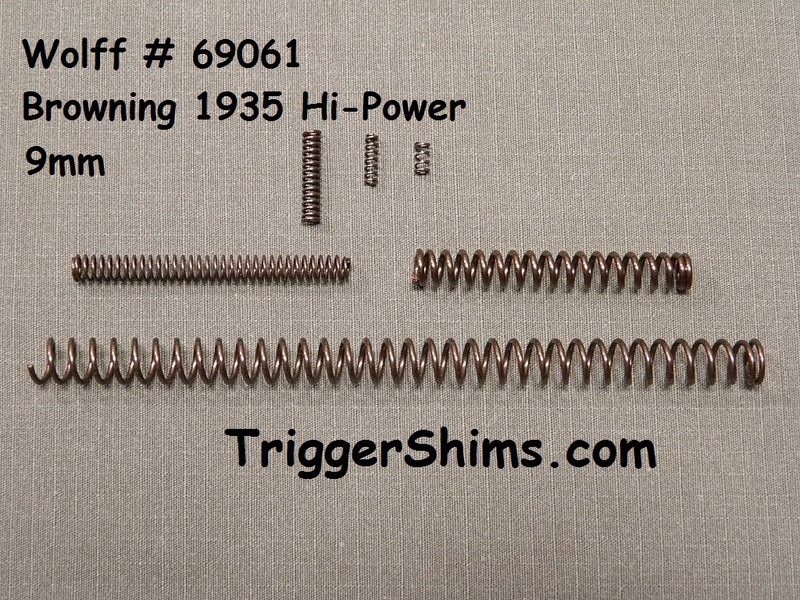 Hammer Spring Pak (coil-type) for the Winchester 94 lever action rifles improve trigger function and letoff. 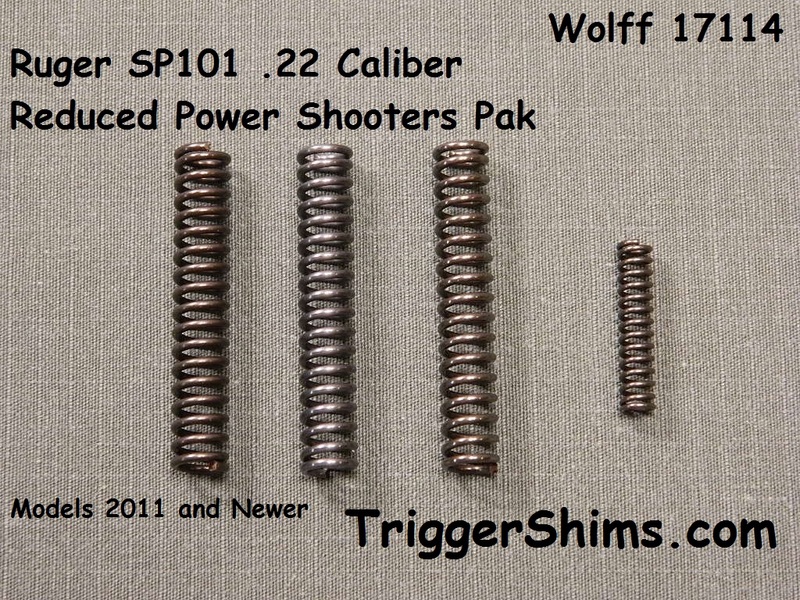 13 and 15 pound reduced power spring allow the shooter a choice trigger improvement. The factory hammer spring is rated at 18 pounds. Please Note: Springs not for use in models with flat-type mainspring. For 9mm Sig P-226 contains 1 each 11 Lb. Reduced Power Variable Recoil Spring, 18 Lb. 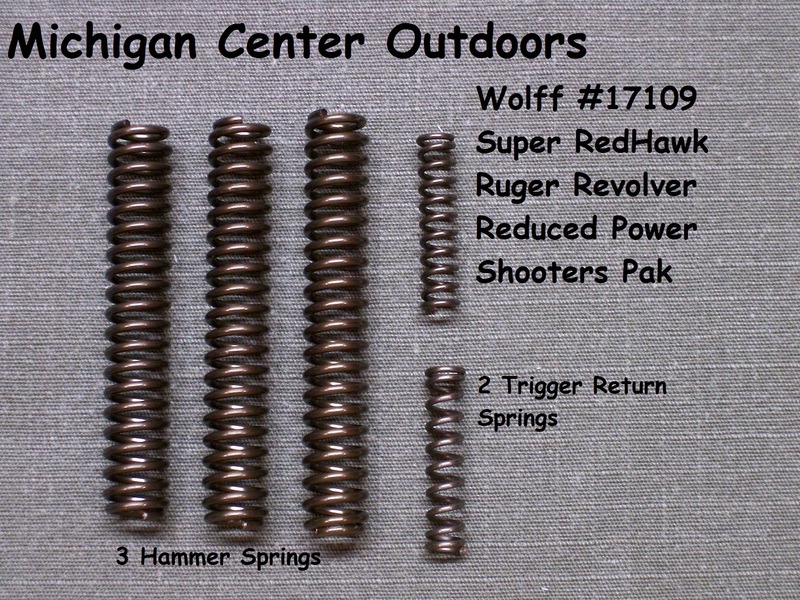 Extra Power Recoil Spring, Extra Power Firing Pin Spring and 17 Lb. Reduced Power Old Style Long Hammer Spring. Note: Factory Standard Recoil Spring Weight for 9mm is 15 Lbs. In 1999 Sig has started using a plastic hammer spring base/retainer with a short hammer spring. We included in this kit is the New Style Short Hammer Spring below. Contains 1 ea. 17 Lb. Reduced Power Hammer Spring. Note: Factory Standard Hammer Spring is 21 Lbs. Sig Sauer Recoil Calibration Pak - For Sig P225/228/229 contains 1 each Extra Power Recoil Springs in 17, 19, and 21 pounds. 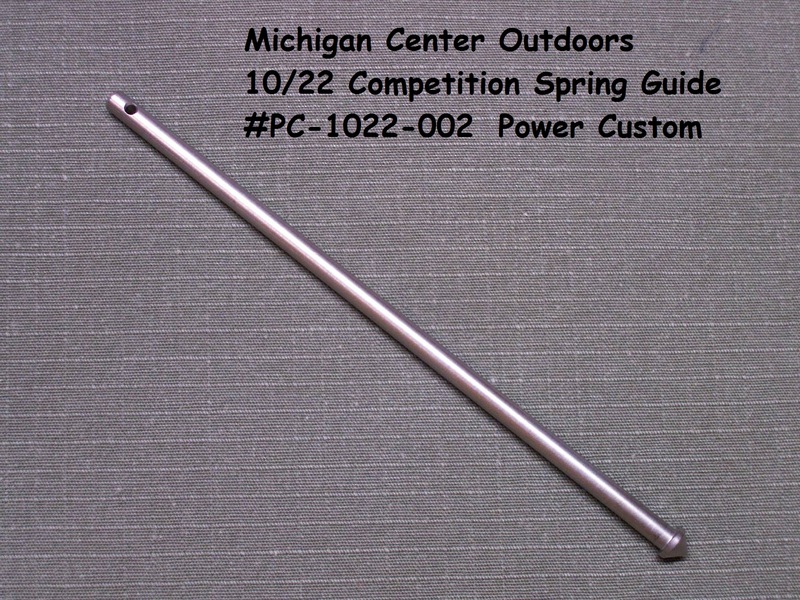 Three extra power firing pin springs are also included. Add a Stainless 4 Piece Trigger Shim Kit for just $5.00 More! 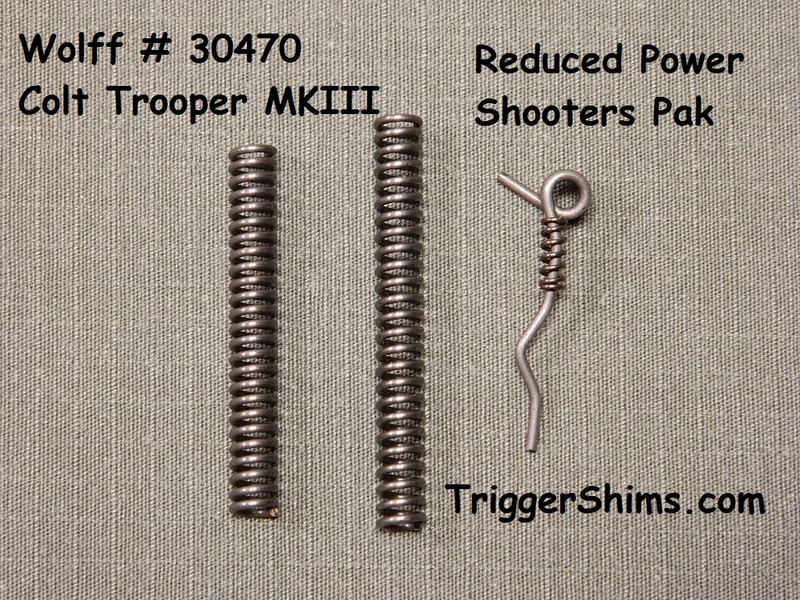 Shooters Pak - Reduced Power - This pak contains 1 each 8 pound reduced power hammer spring and 1 each 13, 14 and 15 pound reduced power rebound springs allowing adjustment for lighter and smoother trigger and hammer action. 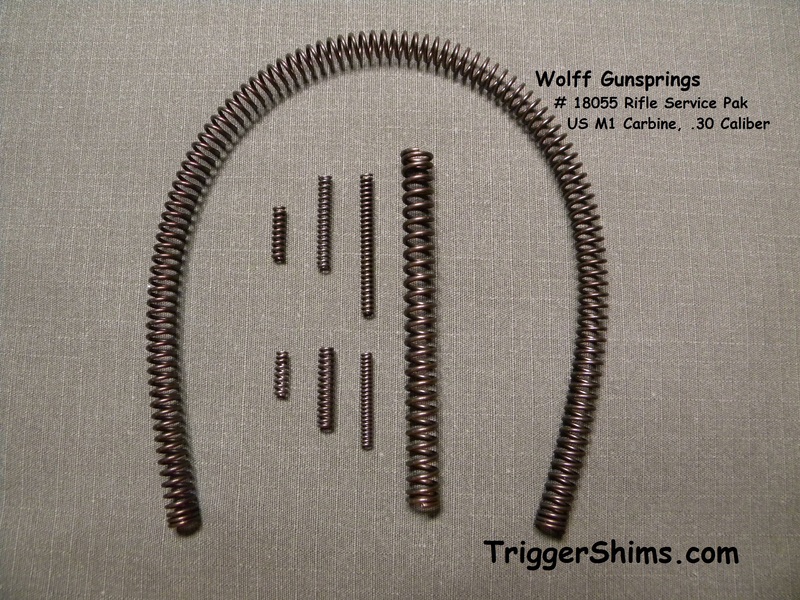 Rebound Springs - Trigger rebound springs are common to all Smith & Wesson J, K, L and N frame revolvers. 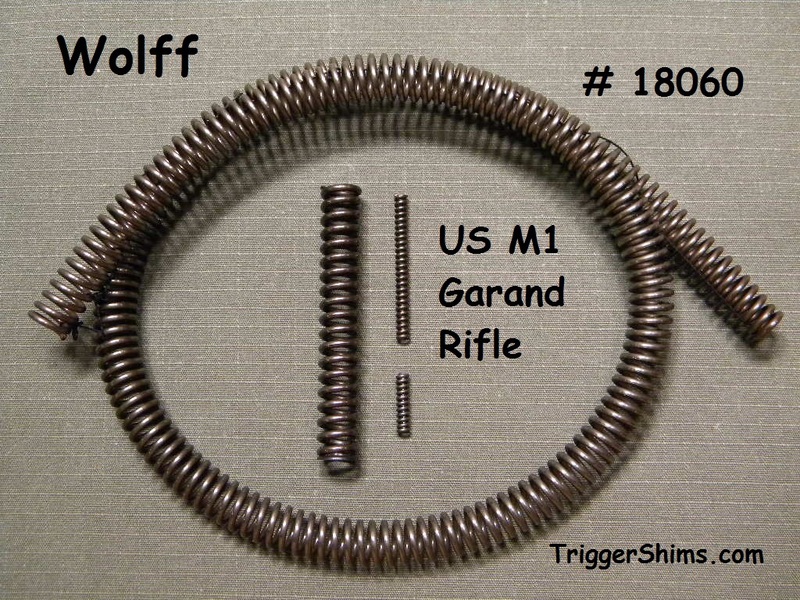 These springs greatly influence the double action trigger pull which is a major concern of competitive shooters. 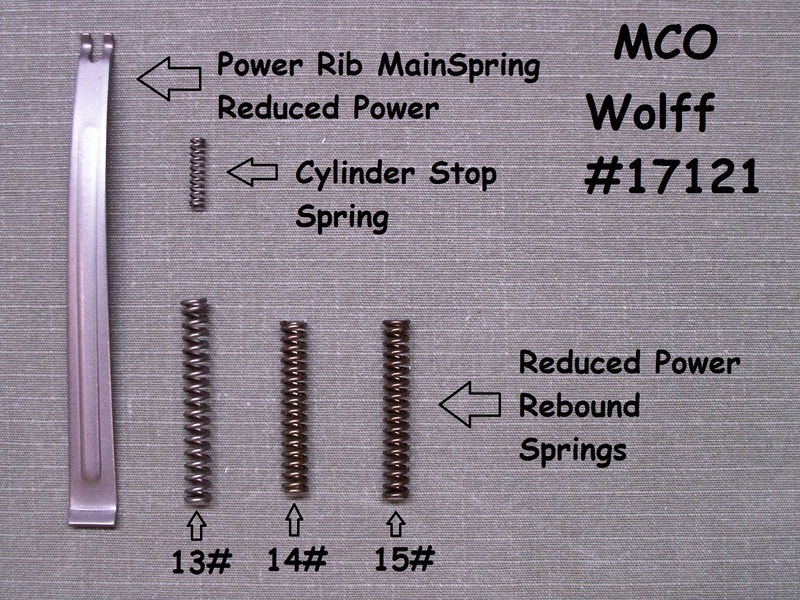 W.C. Wolff company offers reduced power rebound springs rated from 12 to 16 pounds. For reference, the factory rebound spring is 18 pounds. These springs lighten trigger and let-off functions for smoother and easier trigger pull. 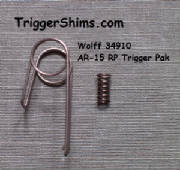 Note: The Hammer Spring in this kit measures 1.650"
OR add an 8 Piece SS Kit for just $10.00 More. 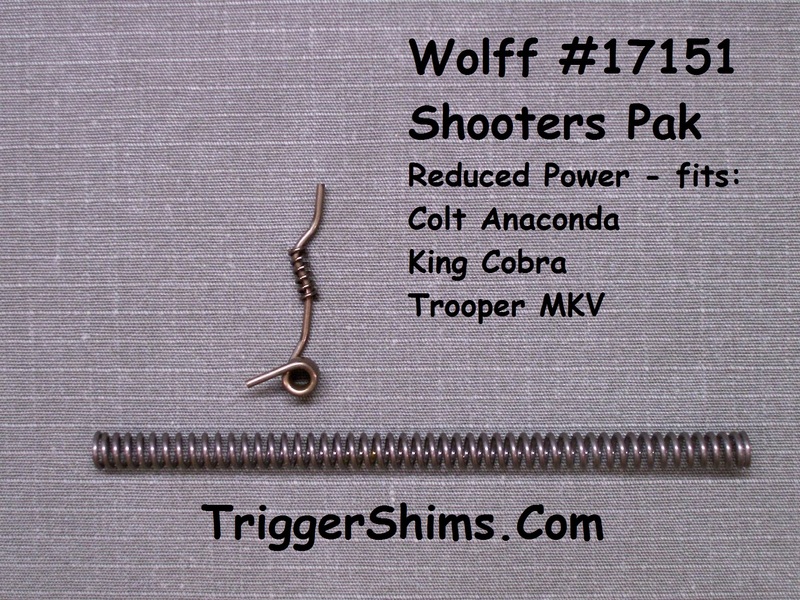 Shooters Pak - Reduced Power - Stock Number 17126 - This pak for rimfire models contains 1 each 9 pound reduced power hammer spring and 1 each 13, 14 and 15 pound reduced power rebound springs allowing adjustment for lighter and smoother trigger and hammer action. Note: Rimfire models 317, 650, 651 have a 12 Lb. factory hammer spring. 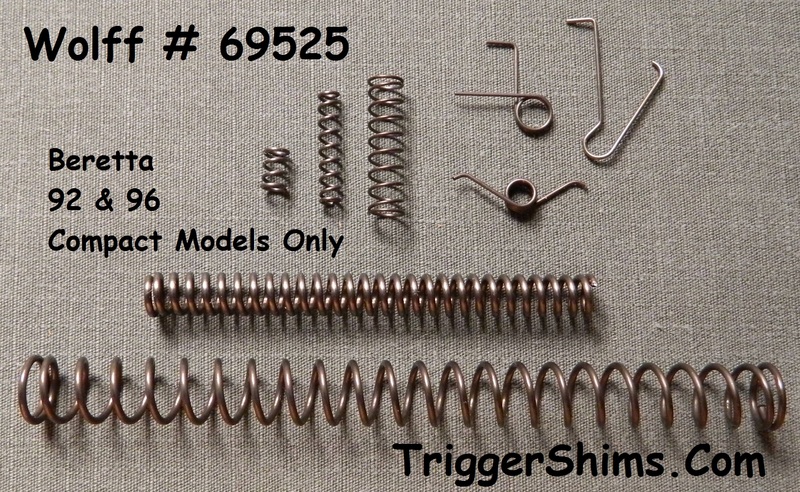 The Hammer Spring in this kit measures 1.750"
Wolff 17126 $14.95 Free Shipping ! The Power Rib Mainspring developed by W.C. Wolff Company is a patented mainspring for use in Smith & Wesson K, L and N frame revolvers. This spring has a unique variable power rib-back design. 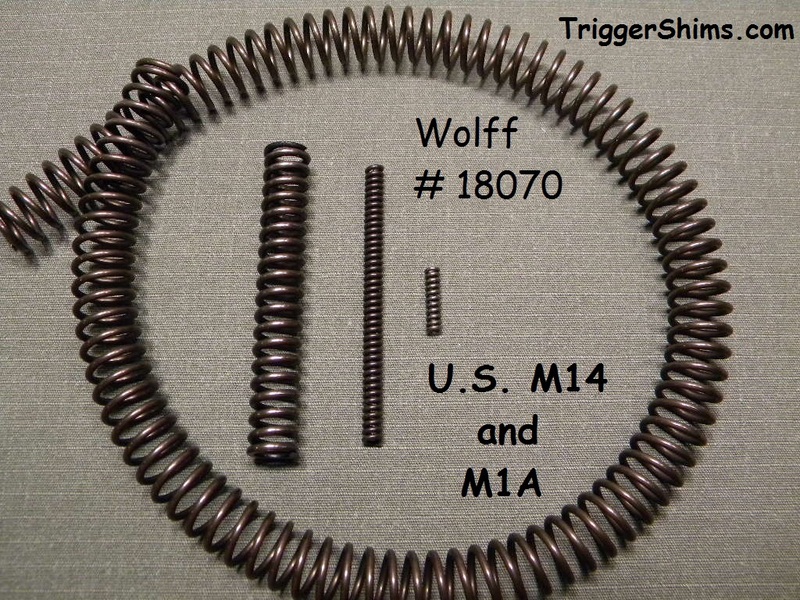 The Wolff Power Rib Mainspring dramatically improves the smoothness and consistency of trigger pull essentially eliminating stack up as well as providing optimum hammer action. This spring can usually take the place of expensive trigger jobs, with better results. 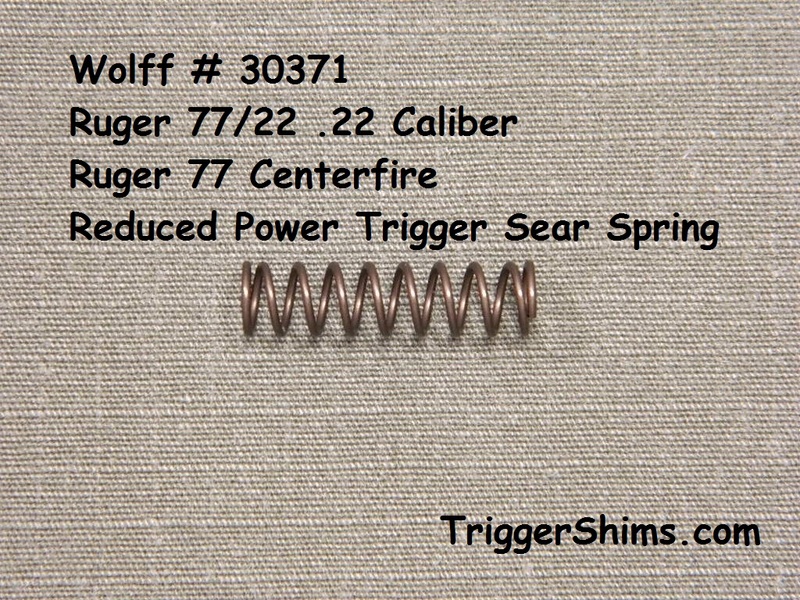 NOTE: For most target and non-critical applications, Wolff recommends the TYPE-2 spring which is reduced power. 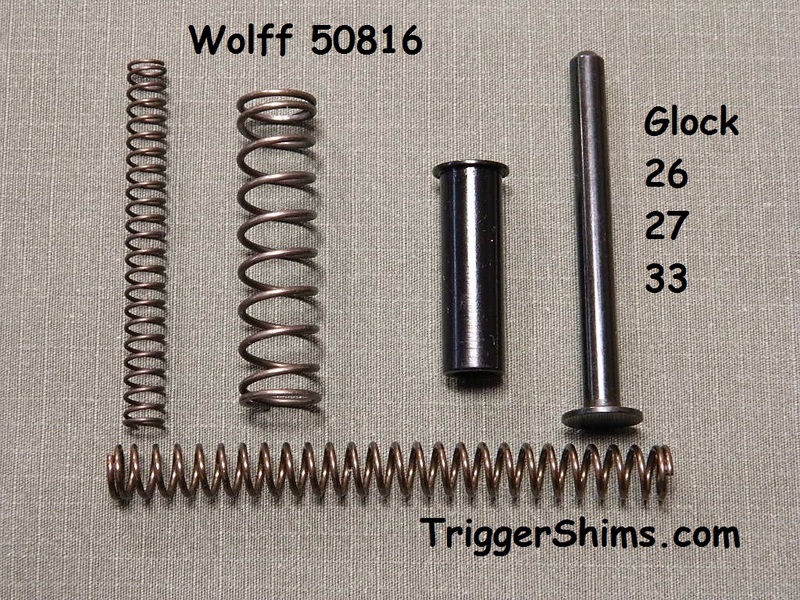 For critical applications such as law enforcement, Wolff strongly recommends the TYPE-1 spring which is factory equivalent in strength. for a total of 5 springs in this kit. Wolff 17121-Type 2 $24.95 Free Shipping! Wolff 17120 Type 1 $24.95 Free Shipping! This spring is included in our 17121 and 17120 Spring Pak. 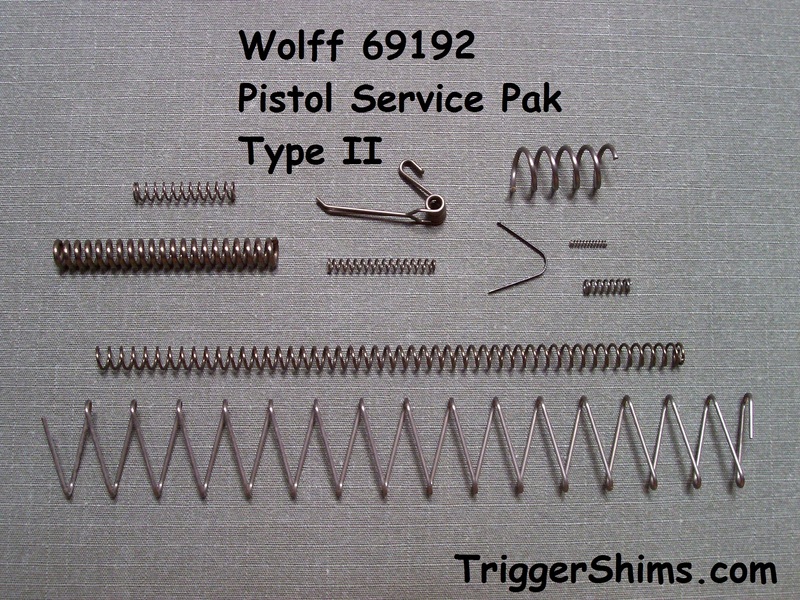 Type 1 Service Pak for Smith & Wesson Semi-Automatic Pistols contains the following springs returning the pistol to original factory condition: Recoil Spring, Extra Power Firing Pin Spring, Hammer Spring, Extractor Spring, 2 Ejector Springs, Magazine Catch Spring, Drawbar Plunger (Trigger Return) Spring, Safety Lever Plunger Spring, Slide Lock Plunger Spring, Safety Lever Detent Spring and 2 Rear Sight Body Plunger Springs. A total of 13 springs in this kit. Wolff 69301 $18.95 Free Shipping! Type 1 Service Pak for Smith & Wesson Semi-Automatic Pistols contains the following springs returning the pistol to original factory condition: Recoil Spring, Extra Power Firing Pin Spring, Hammer Spring, Extractor Spring, 2 Ejector Springs, Magazine Catch Spring, Drawbar Plunger Spring, Safety Lever Plunger Spring, Slide Lock Plunger Spring, Safety Lever Detent Spring and 2 Rear Sight Body Plunger Springs. Wolff 69311 $18.95 Free Shipping! Wolff 69341 $18.95 Free Shipping! Wolff 69351 $18.95 Free Shipping! Wolff 69361 $18.95 Free Shipping! Wolff 69371 $18.95 Free Shipping! Wolff 69381 $18.95 Free Shipping! Wolff 69391 $18.95 Free Shipping! Springfield 1911 Series pistols use the same springs as Colt 1911 Series Pistols with the exception of the hammer springs in some instances. Please see ILS hammer spring note below. In 2001 Springfield started shipping 1911 style pistols with ILS or Integral Locking System. This locking system uses a special mainspring housing with the locking mechanism built in and requires a special mainspring or hammer spring. Verify you have this system before ordering the ILS springs. You will have a key hole in your real mainspring housing. Details are in your owner's manual. 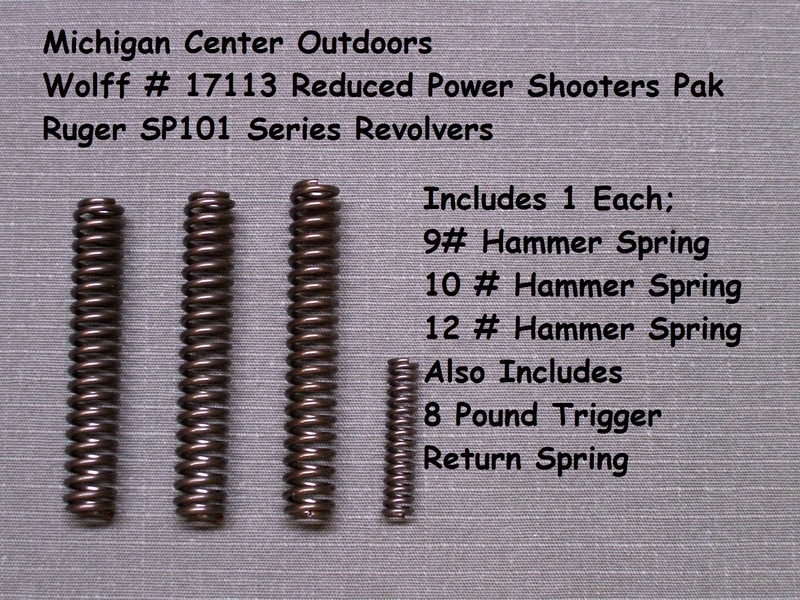 All Springfield 1911 series pistols without ILS use the standard Colt 1911 hammer springs as referenced above. Hammer Spring Pak - Reduced Power. This pak contains 1 each of 24, 26 and 28 pound reduced hammer springs, allowing adjustment of the firearm to individual requirements. Wolff 32357 $16.95 Free Shipping! Trigger Springs may require some modification. 1 Each 9 Pound Reduced Power Hammer Spring and 1 Each 6.5 and 9 Pound Reduced Power Trigger Return Springs Allowing Adjustment for Lighter and Smoother Trigger and Hammer Action. Wolff 30151 $15.95 Free Shipping! 1 Each 10, 11 and 12 Pound Reduced Power Hammer Springs and 1 Each 10 and 11 Pound Reduced Power Trigger Return Springs Allowing Adjustment for Lighter and Smoother Trigger and Hammer Action. Wolff 17190 $16.95 Free Shipping! 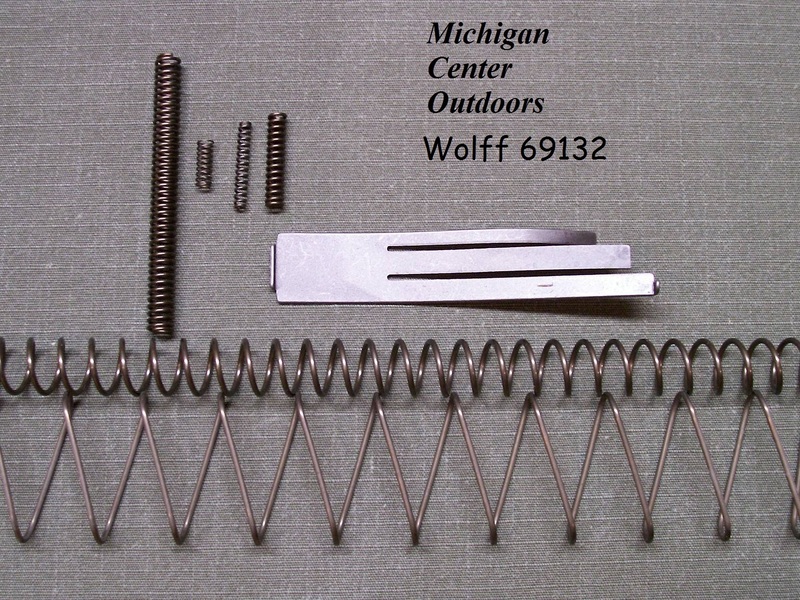 Hammer Spring, Extractor Spring, Magazine Catch Spring, Trigger Guard Spring and Hammer Block Spring. 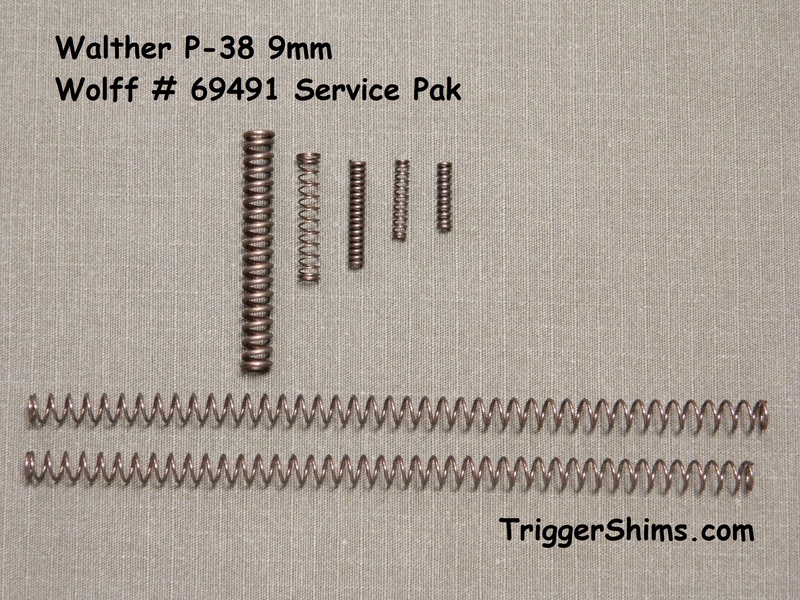 This Service Pak contains the following springs to return the pistol to Original Factory Condition; 2 Recoil Springs, Hammer Spring, Extractor Spring, Auto Firing Pin Lock Spring, Retainer Latch Plunger Spring, Cartridge Indicator Spring. W. C. WOLFF COMPANY GUARANTEES THAT ITS PRODUCTS ARE FREE FROM DEFECTS IN MATERIAL AND WORKMANSHIP. IN THE EVENT OF ANY DEFECTS IN MATERIAL OR WORKMANSHIP, W. C. WOLFF COMPANY’S SOLE LIABILITY THEREFOR SHALL BE THE REPLACEMENT OF ANY SUCH PRODUCT(S) THAT ARE DEFECTIVE IN MATERIAL OR WORKMANSHIP. THE REPLACEMENT OF ANY SUCH PRODUCT(S) SHALL BE W. C. WOLFF COMPANY’S SOLE RESPONSIBILITY. THIS WARRANTY SPECIFICALLY EXCLUDES ANY AND ALL CONSEQUENTIAL OR ACCIDENTAL DAMAGES. NO OTHER WARRANTIES OR LIABILITY WHATSOEVER, ARE EITHER EXPRESSED OR IMPLIED. IF ANY SUCH WARRANTIES SHALL BE IMPOSED BY LAW NOTWITHSTANDING THIS PROVISION, THEN SUCH WARRANTIES SHALL BE THE RESPONSIBILITY OF W. C. WOLFF COMPANY’S IMMEDIATE BUYER. BY WAY OF EXAMPLE, AND NOT LIMITATION, THERE SHALL BE NO WARRANTIES OF MERCHANTABILITY, USE IN TRADE, OR FITNESS FOR A PARTICULAR PURPOSE. W.C. WOLFF COMPANY SHALL HAVE NO LIABILITY FOR LOSS OF USE, REVENUE OR PROFIT. Credit Cards through our Secure PayPal Check-Out! All Website Orders are Shipped the Next Business Day! Gun Parts Shipped to USA Only! BY PURCHASING SHIVELY SALES PRODUCTS YOU RELEASE US FROM ANY AND ALL LEGAL LIABILITY. YOU ASSUME ANY AND ALL RESPONSIBILITY FOR THEIR SAFE INSTALLATION AND USAGE. YOU RETAIN ANY AND ALL RESPONSIBILITY FOR YOUR OWN ACTIONS. Be Safe!! If you have any questions or safety concerns, see a qualified Gunsmith.